These highlights do not include all the information needed to use ADVAIR DISKUS safely and effectively. See full prescribing information for ADVAIR DISKUS. ADVAIR DISKUS is indicated for the twice-daily treatment of asthma in patients aged 4 years and older. ADVAIR DISKUS should be used for patients not adequately controlled on a long-term asthma control medication such as an inhaled corticosteroid (ICS) or whose disease warrants initiation of treatment with both an ICS and long-acting beta2-adrenergic agonist (LABA). ADVAIR DISKUS should be administered as 1 inhalation twice daily by the orally inhaled route only. After inhalation, the patient should rinse his/her mouth with water without swallowing to help reduce the risk of oropharyngeal candidiasis. If asthma symptoms arise in the period between doses, an inhaled, short-acting beta2-agonist should be taken for immediate relief. For patients aged 12 years and older, the dosage is 1 inhalation twice daily, approximately 12 hours apart. When choosing the starting dosage strength of ADVAIR DISKUS, consider the patients’ disease severity, based on their previous asthma therapy, including the ICS dosage, as well as the patients’ current control of asthma symptoms and risk of future exacerbation. The maximum recommended dosage is ADVAIR DISKUS 500/50 twice daily. Improvement in asthma control following inhaled administration of ADVAIR DISKUS can occur within 30 minutes of beginning treatment, although maximum benefit may not be achieved for 1 week or longer after starting treatment. Individual patients will experience a variable time to onset and degree of symptom relief. For patients who do not respond adequately to the starting dosage after 2 weeks of therapy, replacing the current strength of ADVAIR DISKUS with a higher strength may provide additional improvement in asthma control. If a previously effective dosage regimen fails to provide adequate improvement in asthma control, the therapeutic regimen should be reevaluated and additional therapeutic options (e.g., replacing the current strength of ADVAIR DISKUS with a higher strength, adding additional ICS, initiating oral corticosteroids) should be considered. 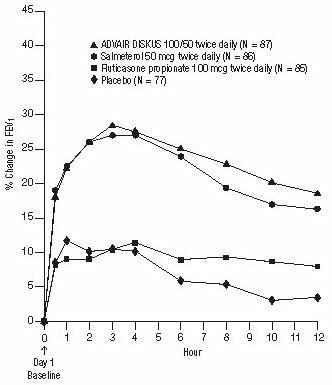 For patients with asthma aged 4 to 11 years who are not controlled on an ICS, the dosage is 1 inhalation of ADVAIR DISKUS 100/50 twice daily, approximately 12 hours apart. The recommended dosage for patients with COPD is 1 inhalation of ADVAIR DISKUS 250/50 twice daily, approximately 12 hours apart. If shortness of breath occurs in the period between doses, an inhaled, short-acting beta2-agonist should be taken for immediate relief. Inhalation powder: Inhaler containing a foil blister strip of powder formulation for oral inhalation. The strip contains a combination of fluticasone propionate 100, 250, or 500 mcg and salmeterol 50 mcg per blister. Primary treatment of status asthmaticus or other acute episodes of asthma or COPD where intensive measures are required [see Warnings and Precautions (5.2)]. Severe hypersensitivity to milk proteins or demonstrated hypersensitivity to fluticasone propionate, salmeterol, or any of the excipients [see Warnings and Precautions (5.11), Adverse Reactions (6.3), Description (11)]. Four (4) large, 26-week, randomized, double-blind, active-controlled clinical safety trials were conducted to evaluate the risk of serious asthma-related events when LABA were used in fixed-dose combination with ICS compared with ICS alone in subjects with asthma. Three (3) trials included adult and adolescent subjects aged 12 years and older: 1 trial compared fluticasone propionate/salmeterol inhalation powder (ADVAIR DISKUS) with fluticasone propionate inhalation powder [see Clinical Studies (14.1)], 1 trial compared mometasone furoate/formoterol with mometasone furoate, and 1 trial compared budesonide/formoterol with budesonide. The fourth trial included pediatric subjects aged 4 to 11 years and compared fluticasone propionate/salmeterol inhalation powder with fluticasone propionate inhalation powder [see Clinical Studies (14.1)]. The primary safety endpoint for all 4 trials was serious asthma-related events (hospitalizations, intubations, death). A blinded adjudication committee determined whether events were asthma related. ADVAIR DISKUS should not be initiated in patients during rapidly deteriorating or potentially life-threatening episodes of asthma or COPD. ADVAIR DISKUS has not been studied in subjects with acutely deteriorating asthma or COPD. The initiation of ADVAIR DISKUS in this setting is not appropriate. Serious acute respiratory events, including fatalities, have been reported when salmeterol, a component of ADVAIR DISKUS, has been initiated in patients with significantly worsening or acutely deteriorating asthma. In most cases, these have occurred in patients with severe asthma (e.g., patients with a history of corticosteroid dependence, low pulmonary function, intubation, mechanical ventilation, frequent hospitalizations, previous life-threatening acute asthma exacerbations) and in some patients with acutely deteriorating asthma (e.g., patients with significantly increasing symptoms; increasing need for inhaled, short-acting beta2-agonists; decreasing response to usual medications; increasing need for systemic corticosteroids; recent emergency room visits; deteriorating lung function). However, these events have occurred in a few patients with less severe asthma as well. It was not possible from these reports to determine whether salmeterol contributed to these events. Increasing use of inhaled, short-acting beta2-agonists is a marker of deteriorating asthma. In this situation, the patient requires immediate reevaluation with reassessment of the treatment regimen, giving special consideration to the possible need for replacing the current strength of ADVAIR DISKUS with a higher strength, adding additional ICS, or initiating systemic corticosteroids. Patients should not use more than 1 inhalation twice daily of ADVAIR DISKUS. 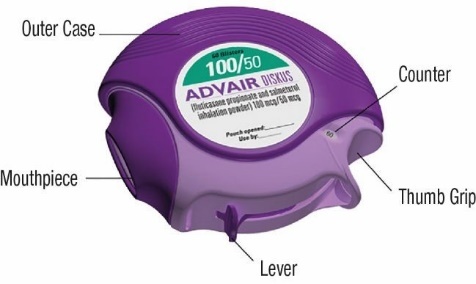 ADVAIR DISKUS should not be used for the relief of acute symptoms, i.e., as rescue therapy for the treatment of acute episodes of bronchospasm. ADVAIR DISKUS has not been studied in the relief of acute symptoms and extra doses should not be used for that purpose. Acute symptoms should be treated with an inhaled, short-acting beta2-agonist. When beginning treatment with ADVAIR DISKUS, patients who have been taking oral or inhaled, short-acting beta2-agonists on a regular basis (e.g., 4 times a day) should be instructed to discontinue the regular use of these drugs. ADVAIR DISKUS should not be used more often than recommended, at higher doses than recommended, or in conjunction with other medicines containing LABA, as an overdose may result. Clinically significant cardiovascular effects and fatalities have been reported in association with excessive use of inhaled sympathomimetic drugs. Patients using ADVAIR DISKUS should not use another medicine containing a LABA (e.g., salmeterol, formoterol fumarate, arformoterol tartrate, indacaterol) for any reason. In clinical trials, the development of localized infections of the mouth and pharynx with Candida albicans has occurred in subjects treated with ADVAIR DISKUS. When such an infection develops, it should be treated with appropriate local or systemic (i.e., oral) antifungal therapy while treatment with ADVAIR DISKUS continues, but at times therapy with ADVAIR DISKUS may need to be interrupted. 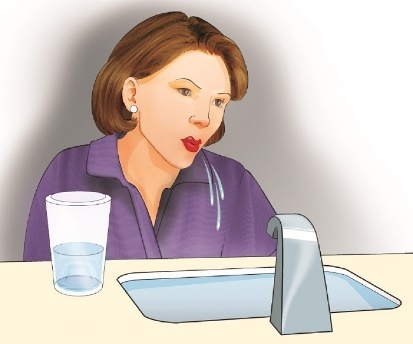 Advise the patient to rinse his/her mouth with water without swallowing following inhalation to help reduce the risk of oropharyngeal candidiasis. Physicians should remain vigilant for the possible development of pneumonia in patients with COPD as the clinical features of pneumonia and exacerbations frequently overlap. Patients who have been previously maintained on 20 mg or more of prednisone (or its equivalent) may be most susceptible, particularly when their systemic corticosteroids have been almost completely withdrawn. During this period of HPA suppression, patients may exhibit signs and symptoms of adrenal insufficiency when exposed to trauma, surgery, or infection (particularly gastroenteritis) or other conditions associated with severe electrolyte loss. Although ADVAIR DISKUS may control asthma symptoms during these episodes, in recommended doses it supplies less than normal physiological amounts of glucocorticoid systemically and does NOT provide the mineralocorticoid activity that is necessary for coping with these emergencies. During periods of stress or a severe asthma attack, patients who have been withdrawn from systemic corticosteroids should be instructed to resume oral corticosteroids (in large doses) immediately and to contact their physicians for further instruction. These patients should also be instructed to carry a warning card indicating that they may need supplementary systemic corticosteroids during periods of stress or a severe asthma attack. Patients requiring oral corticosteroids should be weaned slowly from systemic corticosteroid use after transferring to ADVAIR DISKUS. Prednisone reduction can be accomplished by reducing the daily prednisone dose by 2.5 mg on a weekly basis during therapy with ADVAIR DISKUS. Lung function (mean forced expiratory volume in 1 second [FEV1] or morning peak expiratory flow [AM PEF]), beta-agonist use, and asthma symptoms should be carefully monitored during withdrawal of oral corticosteroids. In addition, patients should be observed for signs and symptoms of adrenal insufficiency, such as fatigue, lassitude, weakness, nausea and vomiting, and hypotension. Transfer of patients from systemic corticosteroid therapy to ADVAIR DISKUS may unmask allergic conditions previously suppressed by the systemic corticosteroid therapy (e.g., rhinitis, conjunctivitis, eczema, arthritis, eosinophilic conditions). Fluticasone propionate, a component of ADVAIR DISKUS, will often help control asthma symptoms with less suppression of HPA function than therapeutically equivalent oral doses of prednisone. Since fluticasone propionate is absorbed into the circulation and can be systemically active at higher doses, the beneficial effects of ADVAIR DISKUS in minimizing HPA dysfunction may be expected only when recommended dosages are not exceeded and individual patients are titrated to the lowest effective dose. A relationship between plasma levels of fluticasone propionate and inhibitory effects on stimulated cortisol production has been shown after 4 weeks of treatment with fluticasone propionate inhalation aerosol. Since individual sensitivity to effects on cortisol production exists, physicians should consider this information when prescribing ADVAIR DISKUS. Because of the possibility of significant systemic absorption of ICS in sensitive patients, patients treated with ADVAIR DISKUS should be observed carefully for any evidence of systemic corticosteroid effects. Particular care should be taken in observing patients postoperatively or during periods of stress for evidence of inadequate adrenal response. It is possible that systemic corticosteroid effects such as hypercorticism and adrenal suppression (including adrenal crisis) may appear in a small number of patients who are sensitive to these effects. If such effects occur, ADVAIR DISKUS should be reduced slowly, consistent with accepted procedures for reducing systemic corticosteroids, and other treatments for management of asthma symptoms should be considered. The use of strong cytochrome P450 3A4 (CYP3A4) inhibitors (e.g., ritonavir, atazanavir, clarithromycin, indinavir, itraconazole, nefazodone, nelfinavir, saquinavir, ketoconazole, telithromycin) with ADVAIR DISKUS is not recommended because increased systemic corticosteroid and increased cardiovascular adverse effects may occur [see Drug Interactions (7.1), Clinical Pharmacology (12.3)]. As with other inhaled medicines, ADVAIR DISKUS can produce paradoxical bronchospasm, which may be life threatening. If paradoxical bronchospasm occurs following dosing with ADVAIR DISKUS, it should be treated immediately with an inhaled, short-acting bronchodilator; ADVAIR DISKUS should be discontinued immediately; and alternative therapy should be instituted. Upper airway symptoms of laryngeal spasm, irritation, or swelling, such as stridor and choking, have been reported in patients receiving ADVAIR DISKUS. Immediate hypersensitivity reactions (e.g., urticaria, angioedema, rash, bronchospasm, hypotension), including anaphylaxis, may occur after administration of ADVAIR DISKUS. There have been reports of anaphylactic reactions in patients with severe milk protein allergy after inhalation of powder products containing lactose; therefore, patients with severe milk protein allergy should not use ADVAIR DISKUS [see Contraindications (4)]. Excessive beta-adrenergic stimulation has been associated with seizures, angina, hypertension or hypotension, tachycardia with rates up to 200 beats/min, arrhythmias, nervousness, headache, tremor, palpitation, nausea, dizziness, fatigue, malaise, and insomnia [see Overdosage (10.2)]. Therefore, ADVAIR DISKUS, like all products containing sympathomimetic amines, should be used with caution in patients with cardiovascular disorders, especially coronary insufficiency, cardiac arrhythmias, and hypertension. Salmeterol, a component of ADVAIR DISKUS, can produce a clinically significant cardiovascular effect in some patients as measured by pulse rate, blood pressure, and/or symptoms. Although such effects are uncommon after administration of salmeterol at recommended doses, if they occur, the drug may need to be discontinued. In addition, beta-agonists have been reported to produce electrocardiogram (ECG) changes, such as flattening of the T wave, prolongation of the QTc interval, and ST segment depression. The clinical significance of these findings is unknown. Large doses of inhaled or oral salmeterol (12 to 20 times the recommended dose) have been associated with clinically significant prolongation of the QTc interval, which has the potential for producing ventricular arrhythmias. Fatalities have been reported in association with excessive use of inhaled sympathomimetic drugs. Decreases in bone mineral density (BMD) have been observed with long-term administration of products containing ICS. The clinical significance of small changes in BMD with regard to long-term consequences such as fracture is unknown. Patients with major risk factors for decreased bone mineral content, such as prolonged immobilization, family history of osteoporosis, postmenopausal status, tobacco use, advanced age, poor nutrition, or chronic use of drugs that can reduce bone mass (e.g., anticonvulsants, oral corticosteroids), should be monitored and treated with established standards of care. Since patients with COPD often have multiple risk factors for reduced BMD, assessment of BMD is recommended prior to initiating ADVAIR DISKUS and periodically thereafter. If significant reductions in BMD are seen and ADVAIR DISKUS is still considered medically important for that patient’s COPD therapy, use of medicine to treat or prevent osteoporosis should be strongly considered. A 2-year trial in 160 subjects (females aged 18 to 40 years, males 18 to 50) with asthma receiving chlorofluorocarbon (CFC)-propelled fluticasone propionate inhalation aerosol 88 or 440 mcg twice daily demonstrated no statistically significant changes in BMD at any time point (24, 52, 76, and 104 weeks of double-blind treatment) as assessed by dual-energy x-ray absorptiometry at lumbar regions L1 through L4. Effects of treatment with ADVAIR DISKUS 250/50 or salmeterol 50 mcg on BMD at the L1-L4 lumbar spine and total hip were evaluated in 186 subjects with COPD (aged 43 to 87 years) in a 3-year double-blind trial. Of those enrolled, 108 subjects (72 males and 36 females) were followed for the entire 3 years. BMD evaluations were conducted at baseline and at 6-month intervals. Conclusions cannot be drawn from this trial regarding BMD decline in subjects treated with ADVAIR DISKUS versus salmeterol due to the inconsistency of treatment differences across gender and between lumbar spine and total hip. In this trial there were 7 non-traumatic fractures reported in 5 subjects treated with ADVAIR DISKUS and 1 non-traumatic fracture in 1 subject treated with salmeterol. None of the non-traumatic fractures occurred in the vertebrae, hip, or long bones. Effects of treatment with ADVAIR DISKUS 500/50, fluticasone propionate 500 mcg, salmeterol 50 mcg, or placebo on BMD was evaluated in a subset of 658 subjects (females and males aged 40 to 80 years) with COPD in the 3-year survival trial. BMD evaluations were conducted at baseline and at 48, 108, and 158 weeks. Conclusions cannot be drawn from this trial because of the large number of dropouts (>50%) before the end of the follow-up and the maldistribution of covariates among the treatment groups that can affect BMD. Fracture risk was estimated for the entire population of subjects with COPD in the survival trial (N = 6,184). The probability of a fracture over 3 years was 6.3% for ADVAIR DISKUS, 5.4% for fluticasone propionate, 5.1% for salmeterol, and 5.1% for placebo. Orally inhaled corticosteroids may cause a reduction in growth velocity when administered to pediatric patients. Monitor the growth of pediatric patients receiving ADVAIR DISKUS routinely (e.g., via stadiometry). To minimize the systemic effects of orally inhaled corticosteroids, including ADVAIR DISKUS, titrate each patient’s dosage to the lowest dosage that effectively controls his/her symptoms [see Dosage and Administration (2.1), Use in Specific Populations (8.4)]. Glaucoma, increased intraocular pressure, and cataracts have been reported in patients with asthma and COPD following the long-term administration of ICS, including fluticasone propionate, a component of ADVAIR DISKUS. Consider referral to an ophthalmologist in patients who develop ocular symptoms or use ADVAIR DISKUS long term. Effects of treatment with ADVAIR DISKUS 500/50, fluticasone propionate 500 mcg, salmeterol 50 mcg, or placebo on development of cataracts or glaucoma was evaluated in a subset of 658 subjects with COPD in the 3-year survival trial. Ophthalmic examinations were conducted at baseline and at 48, 108, and 158 weeks. Conclusions about cataracts cannot be drawn from this trial because the high incidence of cataracts at baseline (61% to 71%) resulted in an inadequate number of subjects treated with ADVAIR DISKUS 500/50 who were eligible and available for evaluation of cataracts at the end of the trial (n = 53). The incidence of newly diagnosed glaucoma was 2% with ADVAIR DISKUS 500/50, 5% with fluticasone propionate, 0% with salmeterol, and 2% with placebo. In rare cases, patients on inhaled fluticasone propionate, a component of ADVAIR DISKUS, may present with systemic eosinophilic conditions. Some of these patients have clinical features of vasculitis consistent with Churg-Strauss syndrome, a condition that is often treated with systemic corticosteroid therapy. These events usually, but not always, have been associated with the reduction and/or withdrawal of oral corticosteroid therapy following the introduction of fluticasone propionate. Cases of serious eosinophilic conditions have also been reported with other ICS in this clinical setting. Physicians should be alert to eosinophilia, vasculitic rash, worsening pulmonary symptoms, cardiac complications, and/or neuropathy presenting in their patients. A causal relationship between fluticasone propionate and these underlying conditions has not been established. ADVAIR DISKUS, like all medicines containing sympathomimetic amines, should be used with caution in patients with convulsive disorders or thyrotoxicosis and in those who are unusually responsive to sympathomimetic amines. Doses of the related beta2-adrenoceptor agonist albuterol, when administered intravenously, have been reported to aggravate preexisting diabetes mellitus and ketoacidosis. Beta-adrenergic agonist medicines may produce significant hypokalemia in some patients, possibly through intracellular shunting, which has the potential to produce adverse cardiovascular effects [see Clinical Pharmacology (12.2)]. The decrease in serum potassium is usually transient, not requiring supplementation. Clinically significant changes in blood glucose and/or serum potassium were seen infrequently during clinical trials with ADVAIR DISKUS at recommended doses. The incidence of adverse reactions associated with ADVAIR DISKUS in Table 2 is based upon two 12-week, placebo-controlled, U.S. clinical trials (Trials 1 and 2). A total of 705 adult and adolescent subjects (349 females and 356 males) previously treated with salmeterol or ICS were treated twice daily with ADVAIR DISKUS (100/50- or 250/50-mcg doses), fluticasone propionate inhalation powder (100- or 250-mcg doses), salmeterol inhalation powder 50 mcg, or placebo. The average duration of exposure was 60 to 79 days in the active treatment groups compared with 42 days in the placebo group. The types of adverse reactions and events reported in Trial 3, a 28-week, non-U.S. clinical trial in 503 subjects previously treated with ICS who were treated twice daily with ADVAIR DISKUS 500/50, fluticasone propionate inhalation powder 500 mcg and salmeterol inhalation powder 50 mcg used concurrently, or fluticasone propionate inhalation powder 500 mcg, were similar to those reported in Table 2. The safety data for pediatric subjects aged 4 to 11 years is based upon 1 U.S. trial of 12 weeks’ treatment duration. A total of 203 subjects (74 females and 129 males) who were receiving ICS at trial entry were randomized to either ADVAIR DISKUS 100/50 or fluticasone propionate inhalation powder 100 mcg twice daily. Common adverse reactions (≥3% and greater than placebo) seen in the pediatric subjects but not reported in the adult and adolescent clinical trials include: throat irritation and ear, nose, and throat infections. Elevation of hepatic enzymes was reported in ≥1% of subjects in clinical trials. The elevations were transient and did not lead to discontinuation from the trials. In addition, there were no clinically relevant changes noted in glucose or potassium. In the two 1-year trials, ADVAIR DISKUS 250/50 was compared with salmeterol in 1,579 subjects (863 males and 716 females). The mean age of the subjects was 65 years, and the majority (94%) was Caucasian. To be enrolled, all of the subjects had to have had a COPD exacerbation in the previous 12 months. In this trial, 88% of the subjects treated with ADVAIR DISKUS and 86% of the subjects treated with salmeterol reported an adverse event. The most common events that occurred with a frequency of >5% and more frequently in the subjects treated with ADVAIR DISKUS were nasopharyngitis, upper respiratory tract infection, nasal congestion, back pain, sinusitis, dizziness, nausea, pneumonia, candidiasis, and dysphonia. Overall, 55 (7%) of the subjects treated with ADVAIR DISKUS and 25 (3%) of the subjects treated with salmeterol developed pneumonia. Cushing’s syndrome, Cushingoid features, growth velocity reduction in children/adolescents, hypercorticism. ADVAIR DISKUS has been used concomitantly with other drugs, including short-acting beta2-agonists, methylxanthines, and intranasal corticosteroids, commonly used in patients with asthma or COPD without adverse drug reactions [see Clinical Pharmacology (12.2)]. No formal drug interaction trials have been performed with ADVAIR DISKUS. Fluticasone propionate and salmeterol, the individual components of ADVAIR DISKUS, are substrates of CYP3A4. The use of strong CYP3A4 inhibitors (e.g., ritonavir, atazanavir, clarithromycin, indinavir, itraconazole, nefazodone, nelfinavir, saquinavir, ketoconazole, telithromycin) with ADVAIR DISKUS is not recommended because increased systemic corticosteroid and increased cardiovascular adverse effects may occur. Fluticasone Propionate: A drug interaction trial with fluticasone propionate aqueous nasal spray in healthy subjects has shown that ritonavir (a strong CYP3A4 inhibitor) can significantly increase plasma fluticasone propionate exposure, resulting in significantly reduced serum cortisol concentrations [see Clinical Pharmacology (12.3)]. During postmarketing use, there have been reports of clinically significant drug interactions in patients receiving fluticasone propionate and ritonavir, resulting in systemic corticosteroid effects including Cushing’s syndrome and adrenal suppression. Fluticasone Propionate: Coadministration of orally inhaled fluticasone propionate (1,000 mcg) and ketoconazole (200 mg once daily) resulted in a 1.9-fold increase in plasma fluticasone propionate exposure and a 45% decrease in plasma cortisol area under the curve (AUC), but had no effect on urinary excretion of cortisol. Salmeterol: In a drug interaction trial in 20 healthy subjects, coadministration of inhaled salmeterol (50 mcg twice daily) and oral ketoconazole (400 mg once daily) for 7 days resulted in greater systemic exposure to salmeterol (AUC increased 16-fold and Cmax increased 1.4-fold). Three (3) subjects were withdrawn due to beta2-agonist side effects (2 with prolonged QTc and 1 with palpitations and sinus tachycardia). Although there was no statistical effect on the mean QTc, coadministration of salmeterol and ketoconazole was associated with more frequent increases in QTc duration compared with salmeterol and placebo administration. ADVAIR DISKUS should be administered with extreme caution to patients being treated with monoamine oxidase inhibitors or tricyclic antidepressants, or within 2 weeks of discontinuation of such agents, because the action of salmeterol, a component of ADVAIR DISKUS, on the vascular system may be potentiated by these agents. Beta-blockers not only block the pulmonary effect of beta-agonists, such as salmeterol, a component of ADVAIR DISKUS, but may also produce severe bronchospasm in patients with asthma or COPD. Therefore, patients with asthma or COPD should not normally be treated with beta-blockers. However, under certain circumstances, there may be no acceptable alternatives to the use of beta-adrenergic blocking agents for these patients; cardioselective beta-blockers could be considered, although they should be administered with caution. The ECG changes and/or hypokalemia that may result from the administration of non–potassium-sparing diuretics (such as loop or thiazide diuretics) can be acutely worsened by beta-agonists, such as salmeterol, a component of ADVAIR DISKUS, especially when the recommended dose of the beta-agonist is exceeded. Although the clinical significance of these effects is not known, caution is advised in the coadministration of ADVAIR DISKUS with non–potassium-sparing diuretics. The estimated risk of major birth defects and miscarriage for the indicated population is unknown. In the U.S. general population, the estimated risk of major birth defects and miscarriage in clinically recognized pregnancies is 2% to 4% and 15% to 20%, respectively. Disease-Associated Maternal and/or Embryofetal Risk: In women with poorly or moderately controlled asthma, there is an increased risk of several perinatal outcomes such as pre-eclampsia in the mother and prematurity, low birth weight, and small for gestational age in the neonate. Pregnant women should be closely monitored and medication adjusted as necessary to maintain optimal control of asthma. Labor and Delivery: There are no human studies evaluating the effects of ADVAIR DISKUS during labor and delivery. Because of the potential for beta-agonist interference with uterine contractility, use of ADVAIR DISKUS during labor should be restricted to those patients in whom the benefits clearly outweigh the risks. Human Data: Fluticasone Propionate: Following inhaled administration, fluticasone propionate was detected in the neonatal cord blood after delivery. Animal Data: Fluticasone Propionate and Salmeterol: In an embryofetal development study with pregnant rats that received the combination of subcutaneous administration of fluticasone propionate and oral administration of salmeterol at doses of 0/1,000; 30/0; 10/100; 30/1,000; and 100/10,000 mcg/kg/day (as fluticasone propionate/salmeterol) during the period of organogenesis, findings were generally consistent with the individual monoproducts and there was no exacerbation of expected fetal effects. Omphalocele, increased embryofetal deaths, decreased body weight, and skeletal variations were observed in rat fetuses in the presence of maternal toxicity when combining fluticasone propionate at a dose approximately equivalent to the MRHDID (on a mcg/m2 basis at a maternal subcutaneous dose of 100 mcg/kg/day) and salmeterol at a dose approximately 970 times the MRHDID (on a mcg/m2 basis at a maternal oral dose of 10,000 mcg/kg/day). The rat no observed adverse effect level (NOAEL) was observed when combining fluticasone propionate at a dose approximately 0.3 times the MRHDID (on a mcg/m2 basis at a maternal subcutaneous dose of 30 mcg/kg/day) and salmeterol at a dose approximately 100 times the MRHDID (on a mcg/m2 basis at a maternal oral dose of 1,000 mcg/kg/day). In an embryofetal development study with pregnant mice that received the combination of subcutaneous administration of fluticasone propionate and oral administration of salmeterol at doses of 0/1,400; 40/0; 10/200; 40/1,400; or 150/10,000 mcg/kg/day (as fluticasone propionate/salmeterol) during the period of organogenesis, findings were generally consistent with the individual monoproducts and there was no exacerbation of expected fetal effects. Cleft palate, fetal death, increased implantation loss, and delayed ossification were observed in mouse fetuses when combining fluticasone propionate at a dose approximately 0.7 times the MRHDID (on a mcg/m2 basis at a maternal subcutaneous dose of 150 mcg/kg/day) and salmeterol at a dose approximately 490 times the MRHDID (on a mcg/m2 basis at a maternal oral dose of 10,000 mcg/kg/day). No developmental toxicity was observed at combination doses of fluticasone propionate up to approximately 0.2 times the MRHDID (on a mcg/m2 basis at a maternal subcutaneous dose of 40 mcg/kg) and doses of salmeterol up to approximately 70 times the MRHDID (on a mcg/m2 basis at a maternal oral dose of 1,400 mcg/kg). Fluticasone Propionate: In embryofetal development studies with pregnant rats and mice dosed by the subcutaneous route throughout the period of organogenesis, fluticasone propionate was teratogenic in both species. Omphalocele, decreased body weight, and skeletal variations were observed in rat fetuses, in the presence of maternal toxicity, at a dose approximately equivalent to the MRHDID (on a mcg/m2 basis with a maternal subcutaneous dose of 100 mcg/kg/day). The rat NOAEL was observed at approximately 0.3 times the MRHDID (on a mcg/m2 basis with a maternal subcutaneous dose of 30 mcg/kg/day). Cleft palate and fetal skeletal variations were observed in mouse fetuses at a dose approximately 0.2 times the MRHDID (on a mcg/m2 basis with a maternal subcutaneous dose of 45 mcg/kg/day). The mouse NOAEL was observed with a dose approximately 0.07 times the MRHDID (on a mcg/m2 basis with a maternal subcutaneous dose of 15 mcg/kg/day). In an embryofetal development study with pregnant rats dosed by the inhalation route throughout the period of organogenesis, fluticasone propionate produced decreased fetal body weights and skeletal variations, in the presence of maternal toxicity, at a dose approximately 0.25 times the MRHDID (on a mcg/m2 basis with a maternal inhalation dose of 25.7 mcg/kg/day); however, there was no evidence of teratogenicity. The NOAEL was observed with a dose approximately 0.05 times the MRHDID (on a mcg/m2 basis with a maternal inhalation dose of 5.5 mcg/kg/day). In an embryofetal development study in pregnant rabbits that were dosed by the subcutaneous route throughout organogenesis, fluticasone propionate produced reductions of fetal body weights, in the presence of maternal toxicity, at doses approximately 0.012 times the MRHDID and higher (on a mcg/m2 basis with a maternal subcutaneous dose of 0.57 mcg/kg/day). Teratogenicity was evident based upon a finding of cleft palate for 1 fetus at a dose approximately 0.08 times the MRHDID (on a mcg/m2 basis with a maternal subcutaneous dose of 4 mcg/kg/day). The NOAEL was observed in rabbit fetuses with a dose approximately 0.002 times the MRHDID (on a mcg/m2 basis with a maternal subcutaneous dose of 0.08 mcg/kg/day). In a pre- and post-natal development study in pregnant rats dosed by the subcutaneous route from late gestation through delivery and lactation (Gestation Day 17 to Postpartum Day 22), fluticasone propionate was not associated with decreases in pup body weight, and had no effects on developmental landmarks, learning, memory, reflexes, or fertility at doses up to 0.5 times the MRHDID (on a mcg/m2 basis with maternal subcutaneous doses up to 50 mcg/kg/day). Salmeterol: In 3 embryofetal development studies, pregnant rabbits received oral administration of salmeterol at doses ranging from 100 to 10,000 mcg/kg/day during the period of organogenesis. In pregnant Dutch rabbits administered salmeterol doses approximately 50 times the MRHDID (on an AUC basis at maternal oral doses of 1,000 mcg/kg/day and higher), fetal toxic effects were observed characteristically resulting from beta-adrenoceptor stimulation. These included precocious eyelid openings, cleft palate, sternebral fusion, limb and paw flexures, and delayed ossification of the frontal cranial bones. No such effects occurred at a salmeterol dose approximately 20 times the MRHDID (on an AUC basis at a maternal oral dose of 600 mcg/kg/day). New Zealand White rabbits were less sensitive since only delayed ossification of the frontal cranial bones was seen at a salmeterol dose approximately 2,000 times the MRHDID (on a mcg/m2 basis at a maternal oral dose of 10,000 mcg/kg/day). In 2 embryofetal development studies, pregnant rats received salmeterol by oral administration at doses ranging from 100 to 10,000 mcg/kg/day during the period of organogenesis. Salmeterol produced no maternal toxicity or embryofetal effects at doses up to 973 times the MRHDID (on a mcg/m2 basis at maternal oral doses up to 10,000 mcg/kg/day). In a peri- and post-natal development study in pregnant rats dosed by the oral route from late gestation through delivery and lactation, salmeterol at a dose 973 times the MRHDID (on a mcg/m2 basis with a maternal oral dose of 10,000 mcg/kg/day) was fetotoxic and decreased the fertility of survivors. Salmeterol xinafoate crossed the placenta following oral administration to mice and rats. There are no available data on the presence of fluticasone propionate or salmeterol in human milk, the effects on the breastfed child, or the effects on milk production. Other corticosteroids have been detected in human milk. However, fluticasone propionate and salmeterol concentrations in plasma after inhaled therapeutic doses are low and therefore concentrations in human breast milk are likely to be correspondingly low [see Clinical Pharmacology (12.3)]. The developmental and health benefits of breastfeeding should be considered along with the mother’s clinical need for ADVAIR DISKUS and any potential adverse effects on the breastfed child from ADVAIR DISKUS or from the underlying maternal condition. Animal Data: Subcutaneous administration of tritiated fluticasone propionate at a dose of 10 mcg/kg/day to lactating rats resulted in measurable levels in milk. Oral administration of salmeterol at a dose of 10,000 mcg/kg/day to lactating rats resulted in measurable levels in milk. Use of ADVAIR DISKUS 100/50 in patients aged 4 to 11 years is supported by extrapolation of efficacy data from older subjects and by safety and efficacy data from a trial of ADVAIR DISKUS 100/50 in children with asthma aged 4 to 11 years [see Adverse Reactions (6.1), Clinical Pharmacology (12.3), Clinical Studies (14.1)]. The safety and effectiveness of ADVAIR DISKUS in children with asthma younger than 4 years have not been established. ICS, including fluticasone propionate, a component of ADVAIR DISKUS, may cause a reduction in growth velocity in children and adolescents [see Warnings and Precautions (5.14)]. The growth of pediatric patients receiving orally inhaled corticosteroids, including ADVAIR DISKUS, should be monitored. A 52-week placebo-controlled trial to assess the potential growth effects of fluticasone propionate inhalation powder (FLOVENT ROTADISK) at 50 and 100 mcg twice daily was conducted in the U.S. in 325 prepubescent children (244 males and 81 females) aged 4 to 11 years. The mean growth velocities at 52 weeks observed in the intent-to-treat population were 6.32 cm/year in the placebo group (n = 76), 6.07 cm/year in the 50-mcg group (n = 98), and 5.66 cm/year in the 100-mcg group (n = 89). An imbalance in the proportion of children entering puberty between groups and a higher dropout rate in the placebo group due to poorly controlled asthma may be confounding factors in interpreting these data. A separate subset analysis of children who remained prepubertal during the trial revealed growth rates at 52 weeks of 6.10 cm/year in the placebo group (n = 57), 5.91 cm/year in the 50-mcg group (n = 74), and 5.67 cm/year in the 100-mcg group (n = 79). In children aged 8.5 years, the mean age of children in this trial, the range for expected growth velocity is: boys – 3rd percentile = 3.8 cm/year, 50th percentile = 5.4 cm/year, and 97th percentile = 7.0 cm/year; girls – 3rd percentile = 4.2 cm/year, 50th percentile = 5.7 cm/year, and 97th percentile = 7.3 cm/year. The clinical relevance of these growth data is not certain. If a child or adolescent on any corticosteroid appears to have growth suppression, the possibility that he/she is particularly sensitive to this effect of corticosteroids should be considered. The potential growth effects of prolonged treatment should be weighed against the clinical benefits obtained. To minimize the systemic effects of orally inhaled corticosteroids, including ADVAIR DISKUS, each patient should be titrated to the lowest strength that effectively controls his/her asthma [see Dosage and Administration (2.1)]. Clinical trials of ADVAIR DISKUS for asthma did not include sufficient numbers of subjects aged 65 years and older to determine whether older subjects with asthma respond differently than younger subjects. Of the total number of subjects in clinical trials receiving ADVAIR DISKUS for COPD, 1,621 were aged 65 years and older and 379 were aged 75 years and older. Subjects with COPD aged 65 years and older had a higher incidence of serious adverse events compared with subjects younger than 65 years. Although the distribution of adverse events was similar in the 2 age groups, subjects older than 65 years experienced more severe events. In two 1-year trials, the excess risk of pneumonia that was seen in subjects treated with ADVAIR DISKUS compared with those treated with salmeterol was greater in subjects older than 65 years than in subjects younger than 65 years [see Adverse Reactions (6.2)]. As with other products containing beta2-agonists, special caution should be observed when using ADVAIR DISKUS in geriatric patients who have concomitant cardiovascular disease that could be adversely affected by beta2-agonists. Based on available data for ADVAIR DISKUS or its active components, no adjustment of dosage of ADVAIR DISKUS in geriatric patients is warranted. No relationship between fluticasone propionate systemic exposure and age was observed in 57 subjects with COPD (aged 40 to 82 years) given 250 or 500 mcg twice daily. Formal pharmacokinetic studies using ADVAIR DISKUS have not been conducted in patients with hepatic impairment. However, since both fluticasone propionate and salmeterol are predominantly cleared by hepatic metabolism, impairment of liver function may lead to accumulation of fluticasone propionate and salmeterol in plasma. Therefore, patients with hepatic disease should be closely monitored. Formal pharmacokinetic studies using ADVAIR DISKUS have not been conducted in patients with renal impairment. No human overdosage data has been reported for ADVAIR DISKUS. ADVAIR DISKUS contains both fluticasone propionate and salmeterol; therefore, the risks associated with overdosage for the individual components described below apply to ADVAIR DISKUS. Treatment of overdosage consists of discontinuation of ADVAIR DISKUS together with institution of appropriate symptomatic and/or supportive therapy. The judicious use of a cardioselective beta-receptor blocker may be considered, bearing in mind that such medication can produce bronchospasm. Cardiac monitoring is recommended in cases of overdosage. Chronic overdosage of fluticasone propionate may result in signs/symptoms of hypercorticism [see Warnings and Precautions (5.8)]. Inhalation by healthy volunteers of a single dose of 4,000 mcg of fluticasone propionate inhalation powder or single doses of 1,760 or 3,520 mcg of fluticasone propionate CFC inhalation aerosol was well tolerated. Fluticasone propionate given by inhalation aerosol at dosages of 1,320 mcg twice daily for 7 to 15 days to healthy human volunteers was also well tolerated. Repeat oral doses up to 80 mg daily for 10 days in healthy volunteers and repeat oral doses up to 20 mg daily for 42 days in subjects were well tolerated. Adverse reactions were of mild or moderate severity, and incidences were similar in active and placebo treatment groups. The expected signs and symptoms with overdosage of salmeterol are those of excessive beta‑adrenergic stimulation and/or occurrence or exaggeration of any of the signs and symptoms of beta-adrenergic stimulation (e.g., seizures, angina, hypertension or hypotension, tachycardia with rates up to 200 beats/min, arrhythmias, nervousness, headache, tremor, muscle cramps, dry mouth, palpitation, nausea, dizziness, fatigue, malaise, insomnia, hyperglycemia, hypokalemia, metabolic acidosis). Overdosage with salmeterol can lead to clinically significant prolongation of the QTc interval, which can produce ventricular arrhythmias. As with all inhaled sympathomimetic medicines, cardiac arrest and even death may be associated with an overdose of salmeterol. Salmeterol xinafoate is a white powder with a molecular weight of 603.8, and the empirical formula is C25H37NO4•C11H8O3. It is freely soluble in methanol; slightly soluble in ethanol, chloroform, and isopropanol; and sparingly soluble in water. 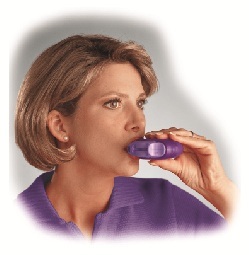 ADVAIR DISKUS is a purple plastic inhaler containing a foil blister strip. Each blister on the strip contains a white powder mix of micronized fluticasone propionate (100, 250, or 500 mcg) and micronized salmeterol xinafoate salt (72.5 mcg, equivalent to 50 mcg of salmeterol base) in 12.5 mg of formulation containing lactose monohydrate (which contains milk proteins). After the inhaler is activated, the powder is dispersed into the airstream created by the patient inhaling through the mouthpiece. Under standardized in vitro test conditions, ADVAIR DISKUS delivers 93, 233, and 465 mcg of fluticasone propionate and 45 mcg of salmeterol base per blister from ADVAIR DISKUS 100/50, ADVAIR DISKUS 250/50, and ADVAIR DISKUS 500/50, respectively, when tested at a flow rate of 60 L/min for 2 seconds. In adult subjects with obstructive lung disease and severely compromised lung function (mean FEV1 20% to 30% of predicted), mean peak inspiratory flow (PIF) through the DISKUS inhaler was 82.4 L/min (range: 46.1 to 115.3 L/min). Inhalation profiles for adolescent (N = 13, aged 12 to 17 years) and adult (N = 17, aged 18 to 50 years) subjects with asthma inhaling maximally through the DISKUS inhaler show mean PIF of 122.2 L/min (range: 81.6 to 152.1 L/min). Inhalation profiles for pediatric subjects with asthma inhaling maximally through the DISKUS inhaler show a mean PIF of 75.5 L/min (range: 49.0 to 104.8 L/min) for the 4-year-old subject set (N = 20) and 107.3 L/min (range: 82.8 to 125.6 L/min) for the 8-year-old subject set (N = 20). 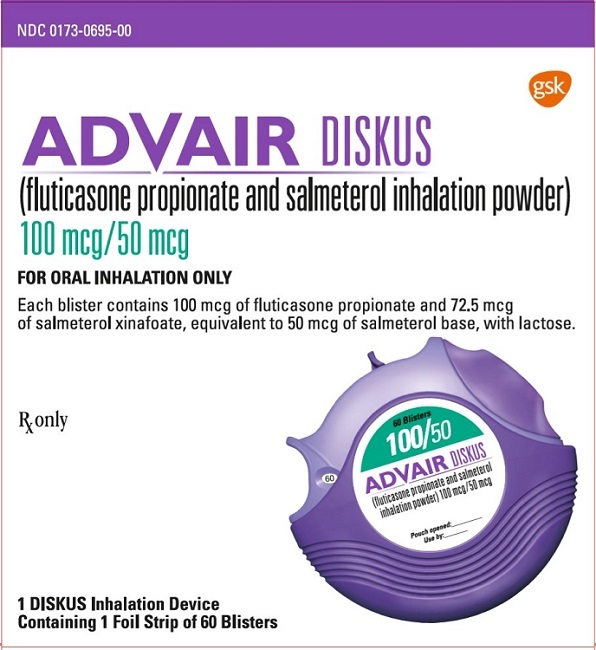 ADVAIR DISKUS contains both fluticasone propionate and salmeterol. The mechanisms of action described below for the individual components apply to ADVAIR DISKUS. These drugs represent 2 different classes of medications (a synthetic corticosteroid and a LABA) that have different effects on clinical, physiologic, and inflammatory indices. Inflammation is an important component in the pathogenesis of asthma. Corticosteroids have been shown to have a wide range of actions on multiple cell types (e.g., mast cells, eosinophils, neutrophils, macrophages, lymphocytes) and mediators (e.g., histamine, eicosanoids, leukotrienes, cytokines) involved in inflammation. These anti-inflammatory actions of corticosteroids contribute to their efficacy in asthma. Inflammation is also a component in the pathogenesis of COPD. In contrast to asthma, however, the predominant inflammatory cells in COPD include neutrophils, CD8+ T-lymphocytes, and macrophages. The effects of corticosteroids in the treatment of COPD are not well defined and ICS and fluticasone propionate when used apart from ADVAIR DISKUS are not indicated for the treatment of COPD. Salmeterol is a selective LABA. In vitro studies show salmeterol to be at least 50 times more selective for beta2-adrenoceptors than albuterol. Although beta2-adrenoceptors are the predominant adrenergic receptors in bronchial smooth muscle and beta1-adrenoceptors are the predominant receptors in the heart, there are also beta2-adrenoceptors in the human heart comprising 10% to 50% of the total beta-adrenoceptors. The precise function of these receptors has not been established, but their presence raises the possibility that even selective beta2-agonists may have cardiac effects. The pharmacologic effects of beta2-adrenoceptor agonist drugs, including salmeterol, are at least in part attributable to stimulation of intracellular adenyl cyclase, the enzyme that catalyzes the conversion of adenosine triphosphate (ATP) to cyclic-3′,5′-adenosine monophosphate (cyclic AMP). Increased cyclic AMP levels cause relaxation of bronchial smooth muscle and inhibition of release of mediators of immediate hypersensitivity from cells, especially from mast cells. In vitro tests show that salmeterol is a potent and long-lasting inhibitor of the release of mast cell mediators, such as histamine, leukotrienes, and prostaglandin D2, from human lung. Salmeterol inhibits histamine-induced plasma protein extravasation and inhibits platelet-activating factor-induced eosinophil accumulation in the lungs of guinea pigs when administered by the inhaled route. In humans, single doses of salmeterol administered via inhalation aerosol attenuate allergen-induced bronchial hyper-responsiveness. Healthy Subjects: Cardiovascular Effects: Since systemic pharmacodynamic effects of salmeterol are not normally seen at the therapeutic dose, higher doses were used to produce measurable effects. Four (4) trials were conducted with healthy adult subjects: (1) a single-dose crossover trial using 2 inhalations of ADVAIR DISKUS 500/50, fluticasone propionate inhalation powder 500 mcg and salmeterol inhalation powder 50 mcg given concurrently, or fluticasone propionate inhalation powder 500 mcg given alone, (2) a cumulative-dose trial using 50 to 400 mcg of salmeterol inhalation powder given alone or as ADVAIR DISKUS 500/50, (3) a repeat-dose trial for 11 days using 2 inhalations twice daily of ADVAIR DISKUS 250/50, fluticasone propionate inhalation powder 250 mcg, or salmeterol inhalation powder 50 mcg, and (4) a single-dose trial using 5 inhalations of ADVAIR DISKUS 100/50, fluticasone propionate inhalation powder 100 mcg alone, or placebo. In these trials no significant differences were observed in the pharmacodynamic effects of salmeterol (pulse rate, blood pressure, QTc interval, potassium, and glucose) whether the salmeterol was given as ADVAIR DISKUS, concurrently with fluticasone propionate from separate inhalers, or as salmeterol alone. The systemic pharmacodynamic effects of salmeterol were not altered by the presence of fluticasone propionate in ADVAIR DISKUS. The potential effect of salmeterol on the effects of fluticasone propionate on the HPA axis was also evaluated in these trials. Hypothalamic-Pituitary-Adrenal Axis Effects: No significant differences across treatments were observed in 24-hour urinary cortisol excretion and, where measured, 24-hour plasma cortisol AUC. The systemic pharmacodynamic effects of fluticasone propionate were not altered by the presence of salmeterol in ADVAIR DISKUS in healthy subjects. Subjects with Asthma: Adult and Adolescent Subjects: Cardiovascular Effects: In clinical trials with ADVAIR DISKUS in adult and adolescent subjects aged 12 years and older with asthma, no significant differences were observed in the systemic pharmacodynamic effects of salmeterol (pulse rate, blood pressure, QTc interval, potassium, and glucose) whether the salmeterol was given alone or as ADVAIR DISKUS. In 72 adult and adolescent subjects with asthma given either ADVAIR DISKUS 100/50 or ADVAIR DISKUS 250/50, continuous 24-hour electrocardiographic monitoring was performed after the first dose and after 12 weeks of therapy, and no clinically significant dysrhythmias were noted. Hypothalamic-Pituitary-Adrenal Axis Effects: In a 28-week trial in adult and adolescent subjects with asthma, ADVAIR DISKUS 500/50 twice daily was compared with the concurrent use of salmeterol inhalation powder 50 mcg plus fluticasone propionate inhalation powder 500 mcg from separate inhalers or fluticasone propionate inhalation powder 500 mcg alone. No significant differences across treatments were observed in serum cortisol AUC after 12 weeks of dosing or in 24-hour urinary cortisol excretion after 12 and 28 weeks. In a 12-week trial in adult and adolescent subjects with asthma, ADVAIR DISKUS 250/50 twice daily was compared with fluticasone propionate inhalation powder 250 mcg alone, salmeterol inhalation powder 50 mcg alone, and placebo. For most subjects, the ability to increase cortisol production in response to stress, as assessed by 30-minute cosyntropin stimulation, remained intact with ADVAIR DISKUS. One subject (3%) who received ADVAIR DISKUS 250/50 had an abnormal response (peak serum cortisol <18 mcg/dL) after dosing, compared with 2 subjects (6%) who received placebo, 2 subjects (6%) who received fluticasone propionate 250 mcg, and no subjects who received salmeterol. In a repeat-dose, 3-way crossover trial, 1 inhalation twice daily of ADVAIR DISKUS 100/50, FLOVENT DISKUS 100 mcg (fluticasone propionate inhalation powder 100 mcg), or placebo was administered to 20 adult and adolescent subjects with asthma. After 28 days of treatment, geometric mean serum cortisol AUC over 12 hours showed no significant difference between ADVAIR DISKUS and FLOVENT DISKUS or between either active treatment and placebo. Pediatric Subjects: Hypothalamic-Pituitary-Adrenal Axis Effects: In a 12-week trial in subjects with asthma aged 4 to 11 years who were receiving ICS at trial entry, ADVAIR DISKUS 100/50 twice daily was compared with fluticasone propionate inhalation powder 100 mcg administered twice daily via the DISKUS. The values for 24-hour urinary cortisol excretion at trial entry and after 12 weeks of treatment were similar within each treatment group. After 12 weeks, 24-hour urinary cortisol excretion was also similar between the 2 groups. Subjects with Chronic Obstructive Pulmonary Disease: Cardiovascular Effects: In clinical trials with ADVAIR DISKUS in subjects with COPD, no significant differences were seen in pulse rate, blood pressure, potassium, and glucose between ADVAIR DISKUS, the individual components of ADVAIR DISKUS, and placebo. In a trial of ADVAIR DISKUS 250/50, 8 subjects (2 [1.1%] in the group given ADVAIR DISKUS 250/50, 1 [0.5%] in the fluticasone propionate 250-mcg group, 3 [1.7%] in the salmeterol group, and 2 [1.1%] in the placebo group) had QTc intervals >470 msec at least 1 time during the treatment period. Five (5) of these 8 subjects had a prolonged QTc interval at baseline. In a 24-week trial, 130 subjects with COPD received continuous 24-hour electrocardiographic monitoring prior to the first dose and after 4 weeks of twice-daily treatment with either ADVAIR DISKUS 500/50, fluticasone propionate inhalation powder 500 mcg, salmeterol inhalation powder 50 mcg, or placebo. No significant differences in ventricular or supraventricular arrhythmias and heart rate were observed among the groups treated with ADVAIR DISKUS 500/50, the individual components, or placebo. One (1) subject in the fluticasone propionate group experienced atrial flutter/atrial fibrillation, and 1 subject in the group given ADVAIR DISKUS 500/50 experienced heart block. There were 3 cases of nonsustained ventricular tachycardia (1 each in the placebo, salmeterol, and fluticasone propionate 500-mcg treatment groups). In 24-week clinical trials in subjects with COPD, the incidence of clinically significant ECG abnormalities (myocardial ischemia, ventricular hypertrophy, clinically significant conduction abnormalities, clinically significant arrhythmias) was lower for subjects who received salmeterol (1%, 9 of 688 subjects who received either salmeterol 50 mcg or ADVAIR DISKUS) compared with placebo (3%, 10 of 370 subjects). No significant differences with salmeterol 50 mcg alone or in combination with fluticasone propionate as ADVAIR DISKUS 500/50 were observed on pulse rate and systolic and diastolic blood pressure in a subset of subjects with COPD who underwent 12-hour serial vital sign measurements after the first dose (n = 183) and after 12 weeks of therapy (n = 149). Median changes from baseline in pulse rate and systolic and diastolic blood pressure were similar to those seen with placebo. Hypothalamic-Pituitary-Adrenal Axis Effects: Short-cosyntropin stimulation testing was performed both at Day 1 and Endpoint in 101 subjects with COPD receiving twice-daily ADVAIR DISKUS 250/50, fluticasone propionate inhalation powder 250 mcg, salmeterol inhalation powder 50 mcg, or placebo. For most subjects, the ability to increase cortisol production in response to stress, as assessed by short cosyntropin stimulation, remained intact with ADVAIR DISKUS 250/50. One (1) subject (3%) who received ADVAIR DISKUS 250/50 had an abnormal stimulated cortisol response (peak cortisol <14.5 mcg/dL assessed by high-performance liquid chromatography) after dosing, compared with 2 subjects (9%) who received fluticasone propionate 250 mcg, 2 subjects (7%) who received salmeterol 50 mcg, and 1 subject (4%) who received placebo following 24 weeks of treatment or early discontinuation from trial. After 36 weeks of dosing, serum cortisol concentrations in a subset of subjects with COPD (n = 83) were 22% lower in subjects receiving ADVAIR DISKUS 500/50 and 21% lower in subjects receiving fluticasone propionate 500 mcg than in subjects receiving placebo. Subjects with Asthma: Hypothalamic-Pituitary-Adrenal Axis Effects: In clinical trials with fluticasone propionate inhalation powder using dosages up to and including 250 mcg twice daily, occasional abnormal short cosyntropin tests (peak serum cortisol <18 mcg/dL assessed by radioimmunoassay) were noted both in subjects receiving fluticasone propionate and in subjects receiving placebo. The incidence of abnormal tests at 500 mcg twice daily was greater than placebo. In a 2-year trial carried out with the DISKHALER inhalation device in 64 subjects with mild, persistent asthma (mean FEV1 91% of predicted) randomized to fluticasone propionate 500 mcg twice daily or placebo, no subject receiving fluticasone propionate had an abnormal response to 6-hour cosyntropin infusion (peak serum cortisol <18 mcg/dL). With a peak cortisol threshold of <35 mcg/dL, 1 subject receiving fluticasone propionate (4%) had an abnormal response at 1 year; repeat testing at 18 months and 2 years was normal. Another subject receiving fluticasone propionate (5%) had an abnormal response at 2 years. No subject on placebo had an abnormal response at 1 or 2 years. Subjects with Chronic Obstructive Pulmonary Disease: Hypothalamic-Pituitary-Adrenal Axis Effects: After 4 weeks of dosing, the steady-state fluticasone propionate pharmacokinetics and serum cortisol levels were described in a subset of subjects with COPD (n = 86) randomized to twice-daily fluticasone propionate inhalation powder via the DISKUS 500 mcg, fluticasone propionate inhalation powder 250 mcg, or placebo. Serial serum cortisol concentrations were measured across a 12-hour dosing interval. Serum cortisol concentrations following 250- and 500-mcg twice-daily dosing were 10% and 21% lower than placebo, respectively, indicating a dose-dependent increase in systemic exposure to fluticasone propionate. Subjects with Asthma: Cardiovascular Effects: Inhaled salmeterol, like other beta-adrenergic agonist drugs, can produce dose-related cardiovascular effects and effects on blood glucose and/or serum potassium [see Warnings and Precautions (5.12, 5.18)]. The cardiovascular effects (heart rate, blood pressure) associated with salmeterol inhalation aerosol occur with similar frequency, and are of similar type and severity, as those noted following albuterol administration. The effects of rising inhaled doses of salmeterol and standard inhaled doses of albuterol were studied in volunteers and in subjects with asthma. Salmeterol doses up to 84 mcg administered as inhalation aerosol resulted in heart rate increases of 3 to 16 beats/min, about the same as albuterol dosed at 180 mcg by inhalation aerosol (4 to 10 beats/min). Adult and adolescent subjects receiving 50-mcg doses of salmeterol inhalation powder (N = 60) underwent continuous electrocardiographic monitoring during two 12-hour periods after the first dose and after 1 month of therapy, and no clinically significant dysrhythmias were noted. Short-acting Beta2-agonists: In clinical trials in subjects with asthma, the mean daily need for albuterol by 166 adult and adolescent subjects aged 12 years and older using ADVAIR DISKUS was approximately 1.3 inhalations/day and ranged from 0 to 9 inhalations/day. Five percent (5%) of subjects using ADVAIR DISKUS in these trials averaged 6 or more inhalations per day over the course of the 12-week trials. No increase in frequency of cardiovascular adverse events was observed among subjects who averaged 6 or more inhalations per day. In a clinical trial in subjects with COPD, the mean daily need for albuterol for subjects using ADVAIR DISKUS 250/50 was 4.1 inhalations/day. Twenty-six percent (26%) of subjects using ADVAIR DISKUS 250/50 averaged 6 or more inhalations of albuterol per day over the course of the 24-week trial. No increase in frequency of cardiovascular adverse reactions was observed among subjects who averaged 6 or more inhalations per day. Methylxanthines: The concurrent use of intravenously or orally administered methylxanthines (e.g., aminophylline, theophylline) by adult and adolescent subjects aged 12 years and older receiving ADVAIR DISKUS has not been completely evaluated. In clinical trials in subjects with asthma, 39 subjects receiving ADVAIR DISKUS 100/50, ADVAIR DISKUS 250/50, or ADVAIR DISKUS 500/50 twice daily concurrently with a theophylline product had adverse event rates similar to those in 304 subjects receiving ADVAIR DISKUS without theophylline. Similar results were observed in subjects receiving salmeterol 50 mcg plus fluticasone propionate 500 mcg twice daily concurrently with a theophylline product (n = 39) or without theophylline (n = 132). In a clinical trial in subjects with COPD, 17 subjects receiving ADVAIR DISKUS 250/50 twice daily concurrently with a theophylline product had adverse event rates similar to those in 161 subjects receiving ADVAIR DISKUS without theophylline. Based on the available data, the concomitant administration of methylxanthines with ADVAIR DISKUS did not alter the observed adverse event profile. Fluticasone Propionate Nasal Spray: In adult and adolescent subjects aged 12 years and older receiving ADVAIR DISKUS in clinical trials, no difference in the profile of adverse events or HPA axis effects was noted between subjects who were receiving FLONASE (fluticasone propionate) Nasal Spray, 50 mcg concurrently (n = 46) and those who were not (n = 130). Fluticasone Propionate: Healthy Subjects: Fluticasone propionate acts locally in the lung; therefore, plasma levels do not predict therapeutic effect. Trials using oral dosing of labeled and unlabeled drug have demonstrated that the oral systemic bioavailability of fluticasone propionate is negligible (<1%), primarily due to incomplete absorption and presystemic metabolism in the gut and liver. In contrast, the majority of the fluticasone propionate delivered to the lung is systemically absorbed. Following administration of ADVAIR DISKUS to healthy adult subjects, peak plasma concentrations of fluticasone propionate were achieved in 1 to 2 hours. In a single-dose crossover trial, a higher-than-recommended dose of ADVAIR DISKUS was administered to 14 healthy adult subjects. Two (2) inhalations of the following treatments were administered: ADVAIR DISKUS 500/50, fluticasone propionate inhalation powder 500 mcg and salmeterol inhalation powder 50 mcg given concurrently, and fluticasone propionate inhalation powder 500 mcg alone. Mean peak plasma concentrations of fluticasone propionate averaged 107, 94, and 120 pg/mL, respectively, indicating no significant changes in systemic exposures of fluticasone propionate. In 15 healthy subjects, systemic exposure to fluticasone propionate from 4 inhalations of ADVAIR HFA 230/21 (fluticasone propionate 230 mcg and salmeterol 21 mcg) Inhalation Aerosol (920/84 mcg) and 2 inhalations of ADVAIR DISKUS 500/50 (1,000/100 mcg) was similar between the 2 inhalers (i.e., 799 versus 832 pg•h/mL, respectively), but approximately half the systemic exposure from 4 inhalations of fluticasone propionate CFC inhalation aerosol 220 mcg (880 mcg, AUC = 1,543 pg•h/mL). Similar results were observed for peak fluticasone propionate plasma concentrations (186 and 182 pg/mL from ADVAIR HFA and ADVAIR DISKUS, respectively, and 307 pg/mL from the fluticasone propionate CFC inhalation aerosol). Absolute bioavailability of fluticasone propionate was 5.3% and 5.5% following administration of ADVAIR HFA and ADVAIR DISKUS, respectively. Subjects with Asthma and COPD: Peak steady-state fluticasone propionate plasma concentrations in adult subjects with asthma (N = 11) ranged from undetectable to 266 pg/mL after a 500-mcg twice-daily dose of fluticasone propionate inhalation powder using the DISKUS inhaler. The mean fluticasone propionate plasma concentration was 110 pg/mL. Full pharmacokinetic profiles were obtained from 9 female and 16 male subjects with asthma given fluticasone propionate inhalation powder 500 mcg twice daily using the DISKUS inhaler and from 14 female and 43 male subjects with COPD given 250 or 500 mcg twice daily. No overall differences in fluticasone propionate pharmacokinetics were observed. Peak steady-state fluticasone propionate plasma concentrations in subjects with COPD averaged 53 pg/mL (range: 19.3 to 159.3 pg/mL) after treatment with 250 mcg twice daily (n = 30) and 84 pg/mL (range: 24.3 to 197.1 pg/mL) after treatment with 500 mcg twice daily (n = 27) via the fluticasone propionate DISKUS inhaler. In another trial in subjects with COPD, peak steady-state fluticasone propionate plasma concentrations averaged 115 pg/mL (range: 52.6 to 366.0 pg/mL) after treatment with 500 mcg twice daily via the fluticasone propionate DISKUS inhaler (n = 15) and 105 pg/mL (range: 22.5 to 299.0 pg/mL) via ADVAIR DISKUS (n = 24). Salmeterol Xinafoate: Healthy Subjects: Salmeterol xinafoate, an ionic salt, dissociates in solution so that the salmeterol and 1-hydroxy-2-naphthoic acid (xinafoate) moieties are absorbed, distributed, metabolized, and eliminated independently. Salmeterol acts locally in the lung; therefore, plasma levels do not predict therapeutic effect. Following administration of ADVAIR DISKUS to healthy adult subjects, peak plasma concentrations of salmeterol were achieved in about 5 minutes. In 15 healthy subjects receiving ADVAIR HFA 230/21 Inhalation Aerosol (920/84 mcg) and ADVAIR DISKUS 500/50 (1,000/100 mcg), systemic exposure to salmeterol was higher (317 versus 169 pg•h/mL) and peak salmeterol concentrations were lower (196 versus 223 pg/mL) following ADVAIR HFA compared with ADVAIR DISKUS, although pharmacodynamic results were comparable. Subjects with Asthma: Because of the small therapeutic dose, systemic levels of salmeterol are low or undetectable after inhalation of recommended dosages (50 mcg of salmeterol inhalation powder twice daily). Following chronic administration of an inhaled dose of 50 mcg of salmeterol inhalation powder twice daily, salmeterol was detected in plasma within 5 to 45 minutes in 7 subjects with asthma; plasma concentrations were very low, with mean peak concentrations of 167 pg/mL at 20 minutes and no accumulation with repeated doses. Fluticasone Propionate: Following intravenous administration, the initial disposition phase for fluticasone propionate was rapid and consistent with its high lipid solubility and tissue binding. The volume of distribution averaged 4.2 L/kg. The percentage of fluticasone propionate bound to human plasma proteins averages 99%. Fluticasone propionate is weakly and reversibly bound to erythrocytes and is not significantly bound to human transcortin. Salmeterol: The percentage of salmeterol bound to human plasma proteins averages 96% in vitro over the concentration range of 8 to 7,722 ng of salmeterol base per milliliter, much higher concentrations than those achieved following therapeutic doses of salmeterol. Fluticasone Propionate: The total clearance of fluticasone propionate is high (average, 1,093 mL/min), with renal clearance accounting for <0.02% of the total. The only circulating metabolite detected in man is the 17β-carboxylic acid derivative of fluticasone propionate, which is formed through the CYP3A4 pathway. This metabolite had less affinity (approximately 1/2,000) than the parent drug for the glucocorticoid receptor of human lung cytosol in vitro and negligible pharmacological activity in animal studies. Other metabolites detected in vitro using cultured human hepatoma cells have not been detected in man. Salmeterol: Salmeterol base is extensively metabolized by hydroxylation, with subsequent elimination predominantly in the feces. No significant amount of unchanged salmeterol base was detected in either urine or feces. An in vitro study using human liver microsomes showed that salmeterol is extensively metabolized to α-hydroxysalmeterol (aliphatic oxidation) by CYP3A4. Ketoconazole, a strong inhibitor of CYP3A4, essentially completely inhibited the formation of α-hydroxysalmeterol in vitro. Fluticasone Propionate: Following intravenous dosing, fluticasone propionate showed polyexponential kinetics and had a terminal elimination half-life of approximately 7.8 hours. Less than 5% of a radiolabeled oral dose was excreted in the urine as metabolites, with the remainder excreted in the feces as parent drug and metabolites. Terminal half-life estimates of fluticasone propionate for ADVAIR HFA, ADVAIR DISKUS, and fluticasone propionate CFC inhalation aerosol were similar and averaged 5.6 hours. Salmeterol: In 2 healthy adult subjects who received 1 mg of radiolabeled salmeterol (as salmeterol xinafoate) orally, approximately 25% and 60% of the radiolabeled salmeterol was eliminated in urine and feces, respectively, over a period of 7 days. The terminal elimination half-life was about 5.5 hours (1 volunteer only). The xinafoate moiety has no apparent pharmacologic activity. The xinafoate moiety is highly protein bound (>99%) and has a long elimination half-life of 11 days. No terminal half-life estimates were calculated for salmeterol following administration of ADVAIR DISKUS. A population pharmacokinetic analysis was performed for fluticasone propionate and salmeterol utilizing data from 9 controlled clinical trials that included 350 subjects with asthma aged 4 to 77 years who received treatment with ADVAIR DISKUS, the combination of HFA-propelled fluticasone propionate and salmeterol inhalation aerosol (ADVAIR HFA), fluticasone propionate inhalation powder (FLOVENT DISKUS), HFA-propelled fluticasone propionate inhalation aerosol (FLOVENT HFA), or CFC-propelled fluticasone propionate inhalation aerosol. The population pharmacokinetic analyses for fluticasone propionate and salmeterol showed no clinically relevant effects of age, gender, race, body weight, body mass index, or percent of predicted FEV1 on apparent clearance and apparent volume of distribution. Age: When the population pharmacokinetic analysis for fluticasone propionate was divided into subgroups based on fluticasone propionate strength, formulation, and age (adolescents/adults and children), there were some differences in fluticasone propionate exposure. 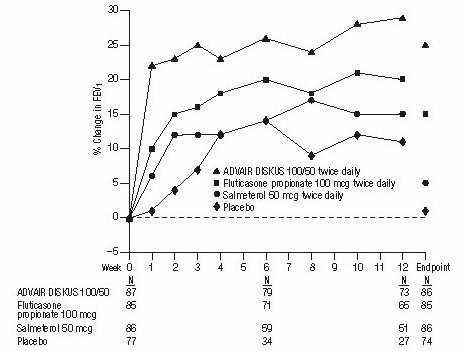 Higher fluticasone propionate exposure from ADVAIR DISKUS 100/50 compared with FLOVENT DISKUS 100 mcg was observed in adolescents and adults (ratio 1.52 [90% CI: 1.08, 2.13]). However, in clinical trials of up to 12 weeks’ duration comparing ADVAIR DISKUS 100/50 and FLOVENT DISKUS 100 mcg in adolescents and adults, no differences in systemic effects of corticosteroid treatment (e.g., HPA axis effects) were observed. Similar fluticasone propionate exposure was observed from ADVAIR DISKUS 500/50 and FLOVENT DISKUS 500 mcg (ratio 0.83 [90% CI: 0.65, 1.07]) in adolescents and adults. Steady-state systemic exposure to salmeterol when delivered as ADVAIR DISKUS 100/50, ADVAIR DISKUS 250/50, or ADVAIR HFA 115/21 (fluticasone propionate 115 mcg and salmeterol 21 mcg) Inhalation Aerosol was evaluated in 127 subjects aged 4 to 57 years. The geometric mean AUC was 325 pg•h/mL (90% CI: 309, 341) in adolescents and adults. The population pharmacokinetic analysis included 160 subjects with asthma aged 4 to 11 years who received ADVAIR DISKUS 100/50 or FLOVENT DISKUS 100 mcg. Higher fluticasone propionate exposure (AUC) was observed in children from ADVAIR DISKUS 100/50 compared with FLOVENT DISKUS 100 mcg (ratio 1.20 [90% CI: 1.06, 1.37]). Higher fluticasone propionate exposure (AUC) from ADVAIR DISKUS 100/50 was observed in children compared with adolescents and adults (ratio 1.63 [90% CI: 1.35, 1.96]). However, in clinical trials of up to 12 weeks’ duration comparing ADVAIR DISKUS 100/50 and FLOVENT DISKUS 100 mcg in both adolescents and adults and in children, no differences in systemic effects of corticosteroid treatment (e.g., HPA axis effects) were observed. Exposure to salmeterol was higher in children compared with adolescents and adults who received ADVAIR DISKUS 100/50 (ratio 1.23 [90% CI: 1.10, 1.38]). However, in clinical trials of up to 12 weeks’ duration with ADVAIR DISKUS 100/50 in both adolescents and adults and in children, no differences in systemic effects of beta2-agonist treatment (e.g., cardiovascular effects, tremor) were observed. Male and Female Patients: The population pharmacokinetic analysis involved 202 males and 148 females with asthma who received fluticasone propionate alone or in combination with salmeterol and showed no gender differences for fluticasone propionate pharmacokinetics. The population pharmacokinetic analysis involved 76 males and 51 females with asthma who received salmeterol in combination with fluticasone propionate and showed no gender differences for salmeterol pharmacokinetics. Patients with Hepatic and Renal Impairment: Formal pharmacokinetic studies using ADVAIR DISKUS have not been conducted in patients with hepatic or renal impairment. However, since both fluticasone propionate and salmeterol are predominantly cleared by hepatic metabolism, impairment of liver function may lead to accumulation of fluticasone propionate and salmeterol in plasma. Therefore, patients with hepatic disease should be closely monitored. In the repeat- and single-dose trials, there was no evidence of significant drug interaction in systemic exposure between fluticasone propionate and salmeterol when given alone or in combination via the DISKUS. The population pharmacokinetic analysis from 9 controlled clinical trials in 350 subjects with asthma showed no significant effects on fluticasone propionate or salmeterol pharmacokinetics following co-administration with beta2-agonists, corticosteroids, antihistamines, or theophyllines. Inhibitors of Cytochrome P450 3A4: Ritonavir: Fluticasone Propionate: Fluticasone propionate is a substrate of CYP3A4. Coadministration of fluticasone propionate and the strong CYP3A4 inhibitor ritonavir is not recommended based upon a multiple-dose, crossover drug interaction trial in 18 healthy subjects. Fluticasone propionate aqueous nasal spray (200 mcg once daily) was coadministered for 7 days with ritonavir (100 mg twice daily). Plasma fluticasone propionate concentrations following fluticasone propionate aqueous nasal spray alone were undetectable (<10 pg/mL) in most subjects, and when concentrations were detectable peak levels (Cmax) averaged 11.9 pg/mL (range: 10.8 to 14.1 pg/mL) and AUC(0-τ) averaged 8.43 pg•h/mL (range: 4.2 to 18.8 pg•h/mL). Fluticasone propionate Cmax and AUC(0-τ) increased to 318 pg/mL (range: 110 to 648 pg/mL) and 3,102.6 pg•h/mL (range: 1,207.1 to 5,662.0 pg•h/mL), respectively, after coadministration of ritonavir with fluticasone propionate aqueous nasal spray. This significant increase in plasma fluticasone propionate exposure resulted in a significant decrease (86%) in serum cortisol AUC. Ketoconazole: Fluticasone Propionate: In a placebo-controlled crossover trial in 8 healthy adult volunteers, coadministration of a single dose of orally inhaled fluticasone propionate (1,000 mcg) with multiple doses of ketoconazole (200 mg) to steady state resulted in increased plasma fluticasone propionate exposure, a reduction in plasma cortisol AUC, and no effect on urinary excretion of cortisol. Salmeterol: In a placebo-controlled, crossover drug interaction trial in 20 healthy male and female subjects, coadministration of salmeterol (50 mcg twice daily) and the strong CYP3A4 inhibitor ketoconazole (400 mg once daily) for 7 days resulted in a significant increase in plasma salmeterol exposure as determined by a 16-fold increase in AUC (ratio with and without ketoconazole 15.76 [90% CI: 10.66, 23.31]) mainly due to increased bioavailability of the swallowed portion of the dose. Peak plasma salmeterol concentrations were increased by 1.4-fold (90% CI: 1.23, 1.68). Three (3) out of 20 subjects (15%) were withdrawn from salmeterol and ketoconazole coadministration due to beta-agonist–mediated systemic effects (2 with QTc prolongation and 1 with palpitations and sinus tachycardia). Coadministration of salmeterol and ketoconazole did not result in a clinically significant effect on mean heart rate, mean blood potassium, or mean blood glucose. Although there was no statistical effect on the mean QTc, coadministration of salmeterol and ketoconazole was associated with more frequent increases in QTc duration compared with salmeterol and placebo administration. Erythromycin: Fluticasone Propionate: In a multiple-dose drug interaction trial, coadministration of orally inhaled fluticasone propionate (500 mcg twice daily) and erythromycin (333 mg 3 times daily) did not affect fluticasone propionate pharmacokinetics. Salmeterol: In a repeat-dose trial in 13 healthy subjects, concomitant administration of erythromycin (a moderate CYP3A4 inhibitor) and salmeterol inhalation aerosol resulted in a 40% increase in salmeterol Cmax at steady state (ratio with and without erythromycin 1.4 [90% CI: 0.96, 2.03], P = 0.12), a 3.6-beat/min increase in heart rate ([95% CI: 0.19, 7.03], P<0.04), a 5.8-msec increase in QTc interval ([95% CI: -6.14, 17.77], P = 0.34), and no change in plasma potassium. Fluticasone propionate demonstrated no tumorigenic potential in mice at oral doses up to 1,000 mcg/kg (approximately 5 and 10 times the MRHDID for adults and children, respectively, on a mcg/m2 basis) for 78 weeks or in rats at inhalation doses up to 57 mcg/kg (less than and approximately equivalent to the MRHDID for adults and children, respectively, on a mcg/m2 basis) for 104 weeks. Fluticasone propionate did not induce gene mutation in prokaryotic or eukaryotic cells in vitro. No significant clastogenic effect was seen in cultured human peripheral lymphocytes in vitro or in the in vivo mouse micronucleus test. Fertility and reproductive performance were unaffected in male and female rats at subcutaneous doses up to 50 mcg/kg (approximately 0.5 times the MRHDID for adults on a mcg/m2 basis). In an 18-month carcinogenicity study in CD-mice, salmeterol at oral doses of 1,400 mcg/kg and above (approximately 20 times the MRHDID for adults and children based on comparison of the plasma AUCs) caused a dose-related increase in the incidence of smooth muscle hyperplasia, cystic glandular hyperplasia, leiomyomas of the uterus, and ovarian cysts. No tumors were seen at 200 mcg/kg (approximately 3 times the MRHDID for adults and children based on comparison of the AUCs). In a 24-month oral and inhalation carcinogenicity study in Sprague Dawley rats, salmeterol caused a dose-related increase in the incidence of mesovarian leiomyomas and ovarian cysts at doses of 680 mcg/kg and above (approximately 66 and 35 times the MRHDID for adults and children, respectively, on a mcg/m2 basis). No tumors were seen at 210 mcg/kg (approximately 20 and 10 times the MRHDID for adults and children, respectively, on a mcg/m2 basis). These findings in rodents are similar to those reported previously for other beta-adrenergic agonist drugs. The relevance of these findings to human use is unknown. Salmeterol produced no detectable or reproducible increases in microbial and mammalian gene mutation in vitro. No clastogenic activity occurred in vitro in human lymphocytes or in vivo in a rat micronucleus test. Fertility and reproductive performance were unaffected in male and female rats at oral doses up to 2,000 mcg/kg (approximately 195 times the MRHDID for adults on a mcg/m2 basis). Studies in laboratory animals (minipigs, rodents, and dogs) have demonstrated the occurrence of cardiac arrhythmias and sudden death (with histologic evidence of myocardial necrosis) when beta-agonists and methylxanthines are administered concurrently. The clinical relevance of these findings is unknown. In clinical trials comparing ADVAIR DISKUS with its individual components, improvements in most efficacy endpoints were greater with ADVAIR DISKUS than with the use of either fluticasone propionate or salmeterol alone. In addition, clinical trials showed similar results between ADVAIR DISKUS and the concurrent use of fluticasone propionate plus salmeterol at corresponding doses from separate inhalers. Trials Comparing ADVAIR DISKUS with Fluticasone Propionate Alone or Salmeterol Alone: Three (3) double-blind, parallel-group clinical trials were conducted with ADVAIR DISKUS in 1,208 adult and adolescent subjects (aged 12 years and older, baseline FEV1 63% to 72% of predicted normal) with asthma that was not optimally controlled on their current therapy. All treatments were inhalation powders given as 1 inhalation from the DISKUS inhaler twice daily, and other maintenance therapies were discontinued. 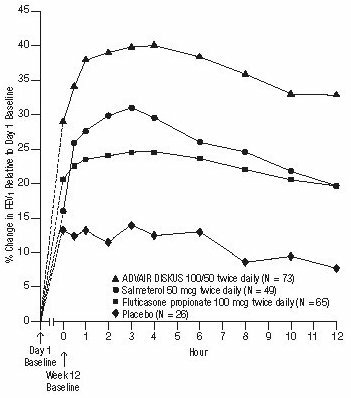 Trial 1: Clinical Trial with ADVAIR DISKUS 100/50: This placebo-controlled, 12-week, U.S. trial compared ADVAIR DISKUS 100/50 with its individual components, fluticasone propionate 100 mcg and salmeterol 50 mcg. The trial was stratified according to baseline asthma maintenance therapy; subjects were using either ICS (n = 250) (daily doses of beclomethasone dipropionate 252 to 420 mcg; flunisolide 1,000 mcg; fluticasone propionate inhalation aerosol 176 mcg; or triamcinolone acetonide 600 to 1,000 mcg) or salmeterol (n = 106). Baseline FEV1 measurements were similar across treatments: ADVAIR DISKUS 100/50, 2.17 L; fluticasone propionate 100 mcg, 2.11 L; salmeterol, 2.13 L; and placebo, 2.15 L.
Predefined withdrawal criteria for lack of efficacy, an indicator of worsening asthma, were utilized for this placebo-controlled trial. Worsening asthma was defined as a clinically important decrease in FEV1 or PEF, increase in use of VENTOLIN (albuterol, USP) Inhalation Aerosol, increase in night awakenings due to asthma, emergency intervention or hospitalization due to asthma, or requirement for asthma medication not allowed by the protocol. As shown in Table 4, statistically significantly fewer subjects receiving ADVAIR DISKUS 100/50 were withdrawn due to worsening asthma compared with fluticasone propionate, salmeterol, and placebo. The FEV1 results are displayed in Figure 1. Because this trial used predetermined criteria for worsening asthma, which caused more subjects in the placebo group to be withdrawn, FEV1 results at Endpoint (last available FEV1 result) are also provided. Subjects receiving ADVAIR DISKUS 100/50 had significantly greater improvements in FEV1 (0.51 L, 25%) compared with fluticasone propionate 100 mcg (0.28 L, 15%), salmeterol (0.11 L, 5%), and placebo (0.01 L, 1%). 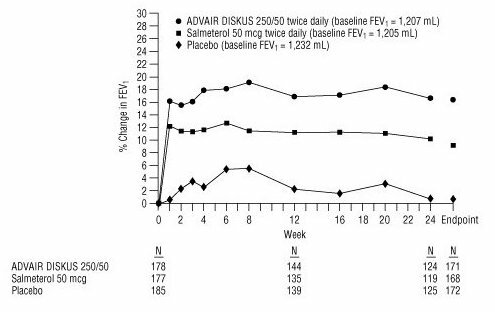 These improvements in FEV1 with ADVAIR DISKUS were achieved regardless of baseline asthma maintenance therapy (ICS or salmeterol). The effect of ADVAIR DISKUS 100/50 on morning and evening PEF endpoints is shown in Table 5.
a Change from baseline = change from baseline at Endpoint (last available data). The subjective impact of asthma on subjects’ perception of health was evaluated through use of an instrument called the Asthma Quality of Life Questionnaire (AQLQ) (based on a 7-point scale where 1 = maximum impairment and 7 = none). Subjects receiving ADVAIR DISKUS 100/50 had clinically meaningful improvements in overall asthma-specific quality of life as defined by a difference between groups of ≥0.5 points in change from baseline AQLQ scores (difference in AQLQ score of 1.25 compared with placebo). Trial 2: Clinical Trial with ADVAIR DISKUS 250/50: This placebo-controlled, 12-week, U.S. trial compared ADVAIR DISKUS 250/50 with its individual components, fluticasone propionate 250 mcg and salmeterol 50 mcg, in 349 subjects with asthma using ICS (daily doses of beclomethasone dipropionate 462 to 672 mcg; flunisolide 1,250 to 2,000 mcg; fluticasone propionate inhalation aerosol 440 mcg; or triamcinolone acetonide 1,100 to 1,600 mcg). Baseline FEV1 measurements were similar across treatments: ADVAIR DISKUS 250/50, 2.23 L; fluticasone propionate 250 mcg, 2.12 L; salmeterol, 2.20 L; and placebo, 2.19 L.
Efficacy results in this trial were similar to those observed in Trial 1. Subjects receiving ADVAIR DISKUS 250/50 had significantly greater improvements in FEV1 (0.48 L, 23%) compared with fluticasone propionate 250 mcg (0.25 L, 13%), salmeterol (0.05 L, 4%), and placebo (decrease of 0.11 L, decrease of 5%). Statistically significantly fewer subjects receiving ADVAIR DISKUS 250/50 were withdrawn from this trial for worsening asthma (4%) compared with fluticasone propionate (22%), salmeterol (38%), and placebo (62%). In addition, ADVAIR DISKUS 250/50 was superior to fluticasone propionate, salmeterol, and placebo for improvements in morning and evening PEF. Subjects receiving ADVAIR DISKUS 250/50 also had clinically meaningful improvements in overall asthma-specific quality of life as described in Trial 1 (difference in AQLQ score of 1.29 compared with placebo). Trial 3: Clinical Trial with ADVAIR DISKUS 500/50: This 28-week, non-U.S. trial compared ADVAIR DISKUS 500/50 with fluticasone propionate 500 mcg alone and concurrent therapy (salmeterol 50 mcg plus fluticasone propionate 500 mcg administered from separate inhalers) twice daily in 503 subjects with asthma using ICS (daily doses of beclomethasone dipropionate 1,260 to 1,680 mcg; budesonide 1,500 to 2,000 mcg; flunisolide 1,500 to 2,000 mcg; or fluticasone propionate inhalation aerosol 660 to 880 mcg [750 to 1,000 mcg inhalation powder]). The primary efficacy parameter, morning PEF, was collected daily for the first 12 weeks of the trial. The primary purpose of weeks 13 to 28 was to collect safety data. Baseline PEF measurements were similar across treatments: ADVAIR DISKUS 500/50, 359 L/min; fluticasone propionate 500 mcg, 351 L/min; and concurrent therapy, 345 L/min. Morning PEF improved significantly with ADVAIR DISKUS 500/50 compared with fluticasone propionate 500 mcg over the 12-week treatment period. Improvements in morning PEF observed with ADVAIR DISKUS 500/50 were similar to improvements observed with concurrent therapy. Onset of Action and Progression of Improvement in Asthma Control: The onset of action and progression of improvement in asthma control were evaluated in the 2 placebo-controlled U.S. trials. Following the first dose, the median time to onset of clinically significant bronchodilatation (≥15% improvement in FEV1) in most subjects was seen within 30 to 60 minutes. Maximum improvement in FEV1 generally occurred within 3 hours, and clinically significant improvement was maintained for 12 hours (Figure 2). Following the initial dose, predose FEV1 relative to Day 1 baseline improved markedly over the first week of treatment and continued to improve over the 12 weeks of treatment in both trials. No diminution in the 12-hour bronchodilator effect was observed with either ADVAIR DISKUS 100/50 (Figures 2 and 3) or ADVAIR DISKUS 250/50 as assessed by FEV1 following 12 weeks of therapy. Reduction in asthma symptoms and use of rescue VENTOLIN Inhalation Aerosol and improvement in morning and evening PEF also occurred within the first day of treatment with ADVAIR DISKUS, and continued to improve over the 12 weeks of therapy in both trials. In a 12-week U.S. trial, ADVAIR DISKUS 100/50 twice daily was compared with fluticasone propionate inhalation powder 100 mcg twice daily in 203 children with asthma aged 4 to 11 years. At trial entry, the children were symptomatic on low doses of ICS (beclomethasone dipropionate 252 to 336 mcg/day; budesonide 200 to 400 mcg/day; flunisolide 1,000 mcg/day; triamcinolone acetonide 600 to 1,000 mcg/day; or fluticasone propionate 88 to 250 mcg/day). 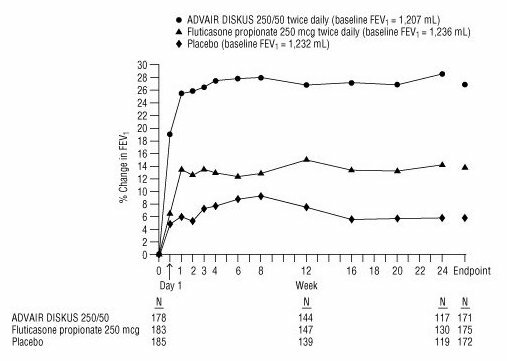 The primary objective of this trial was to determine the safety of ADVAIR DISKUS 100/50 compared with fluticasone propionate inhalation powder 100 mcg in this age group; however, the trial also included secondary efficacy measures of pulmonary function. Morning predose FEV1 was obtained at baseline and Endpoint (last available FEV1 result) in children aged 6 to 11 years. In subjects receiving ADVAIR DISKUS 100/50, FEV1 increased from 1.70 L at baseline (n = 79) to 1.88 L at Endpoint (n = 69) compared with an increase from 1.65 L at baseline (n = 83) to 1.77 L at Endpoint (n = 75) in subjects receiving fluticasone propionate 100 mcg. The findings of this trial, along with extrapolation of efficacy data from subjects aged 12 years and older, support the overall conclusion that ADVAIR DISKUS 100/50 is efficacious in the treatment of asthma in subjects aged 4 to 11 years. Serious Asthma-Related Events: Two 26-week, randomized, double-blind, parallel-group, active comparator trials were conducted to compare the safety and efficacy of ADVAIR DISKUS with fluticasone propionate inhalation powder in adult and adolescent subjects (Trial 4, NCT01475721) and in pediatric subjects aged 4 to 11 years (Trial 5, NCT01462344). The primary safety objective of both trials was to evaluate whether the addition of salmeterol xinafoate to fluticasone propionate therapy (ADVAIR DISKUS) was non-inferior to ICS fluticasone propionate in terms of the risk of a serious asthma-related event (hospitalization, endotracheal intubation, and death). The trials were designed to rule out pre-defined risk margins for serious asthma-related events of 2.0 for Trial 4 and 2.7 for Trial 5. A blinded adjudication committee determined whether events were asthma related. Trial 4 enrolled subjects with moderate to severe persistent asthma with a history of asthma-related hospitalization or at least 1 asthma exacerbation in the previous year treated with systemic corticosteroids. A total of 11,679 adult and adolescent subjects [5,834 receiving ADVAIR DISKUS 100/50, ADVAIR DISKUS 250/50, or ADVAIR DISKUS 500/50 and 5,845 receiving fluticasone propionate inhalation powder (100, 250, or 500 mcg)] were included. Trial 5 enrolled subjects with a diagnosis of asthma and a history of at least 1 asthma exacerbation in the previous year treated with systemic corticosteroid. A total of 6,208 subjects aged 4 to 11 years [3,107 receiving ADVAIR DISKUS 100/50 or ADVAIR DISKUS 250/50 and 3,101 receiving fluticasone propionate inhalation powder (100 or 250 mcg)] were included. In both trials, subjects with life-threatening asthma were excluded. In Trials 4 and 5, ADVAIR DISKUS was non-inferior to fluticasone propionate in terms of time to first serious asthma-related events based on the pre-specified risk margins, with estimated hazard ratios of 1.03 (95% CI: 0.64, 1.66) and 1.29 (95% CI: 0.73, 2.27), respectively (Table 6). a Number of subjects with event that occurred within 6 months after the first use of study drug or 7 days after the last date of study drug treatment, whichever date was later. Subjects can have one or more events, but only the first event was counted for analysis. A blinded adjudication committee determined whether events were asthma related. b The hazard ratio for time to first event was based on a Cox proportional hazards model with a single covariate of treatment (ADVAIR DISKUS vs. fluticasone propionate) and baseline hazards stratified by incoming asthma medication/asthma control status. If the resulting upper 95% CI estimate for the relative risk was <2.0 (Trial 4) or <2.7 (Trial 5), then non-inferiority was concluded. Effect on Exacerbation: Trials 4 and 5 included time to first exacerbation as a secondary endpoint, where exacerbation was defined as a deterioration of asthma requiring the use of systemic corticosteroids for at least 3 days or an in-patient hospitalization or emergency department visit due to asthma that required systemic corticosteroids. In Trials 4 and 5, the hazard ratio for the time to first asthma exacerbation for ADVAIR DISKUS relative to fluticasone propionate inhalation powder was 0.79 (95% CI: 0.70, 0.89) and 0.86 (95% CI: 0.73, 1.01), respectively. The difference in exacerbations was primarily driven by a reduction in those requiring systemic corticosteroids only. The efficacy of ADVAIR DISKUS 250/50 and ADVAIR DISKUS 500/50 in the treatment of subjects with COPD was evaluated in 6 randomized, double-blind, parallel-group clinical trials in adult subjects aged 40 years and older. These trials were primarily designed to evaluate the efficacy of ADVAIR DISKUS on lung function (3 trials), exacerbations (2 trials), and survival (1 trial). Two (2) of the 3 clinical trials primarily designed to evaluate the efficacy of ADVAIR DISKUS on lung function were conducted in 1,414 subjects with COPD associated with chronic bronchitis. In these 2 trials, all the subjects had a history of cough productive of sputum that was not attributable to another disease process on most days for at least 3 months of the year for at least 2 years. The trials were randomized, double-blind, parallel-group, 24-week treatment duration. One (1) trial evaluated the efficacy of ADVAIR DISKUS 250/50 compared with its components fluticasone propionate 250 mcg and salmeterol 50 mcg and with placebo, and the other trial evaluated the efficacy of ADVAIR DISKUS 500/50 compared with its components fluticasone propionate 500 mcg and salmeterol 50 mcg and with placebo. Trial treatments were inhalation powders given as 1 inhalation from the DISKUS inhaler twice daily. Maintenance COPD therapies were discontinued, with the exception of theophylline. The subjects had a mean pre-bronchodilator FEV1 of 41% and 20% reversibility at trial entry. Percent reversibility was calculated as 100 times (FEV1 post-albuterol minus FEV1 pre-albuterol)/FEV1 pre-albuterol. Improvements in lung function (as defined by predose and postdose FEV1) were significantly greater with ADVAIR DISKUS than with fluticasone propionate, salmeterol, or placebo. The improvement in lung function with ADVAIR DISKUS 500/50 was similar to the improvement seen with ADVAIR DISKUS 250/50. Figures 4 and 5 display predose and 2-hour postdose, respectively, FEV1 results for the trial with ADVAIR DISKUS 250/50. To account for subject withdrawals during the trial, FEV1 at Endpoint (last evaluable FEV1) was evaluated. Subjects receiving ADVAIR DISKUS 250/50 had significantly greater improvements in predose FEV1 at Endpoint (165 mL, 17%) compared with salmeterol 50 mcg (91 mL, 9%) and placebo (1 mL, 1%), demonstrating the contribution of fluticasone propionate to the improvement in lung function with ADVAIR DISKUS (Figure 4). Subjects receiving ADVAIR DISKUS 250/50 had significantly greater improvements in postdose FEV1 at Endpoint (281 mL, 27%) compared with fluticasone propionate 250 mcg (147 mL, 14%) and placebo (58 mL, 6%), demonstrating the contribution of salmeterol to the improvement in lung function with ADVAIR DISKUS (Figure 5). The third trial was a 1-year trial that evaluated ADVAIR DISKUS 500/50, fluticasone propionate 500 mcg, salmeterol 50 mcg, and placebo in 1,465 subjects. The subjects had an established history of COPD and exacerbations, a pre-bronchodilator FEV1 <70% of predicted at trial entry, and 8.3% reversibility. The primary endpoint was the comparison of pre-bronchodilator FEV1 in the groups receiving ADVAIR DISKUS 500/50 or placebo. Subjects treated with ADVAIR DISKUS 500/50 had greater improvements in FEV1 (113 mL, 10%) compared with fluticasone propionate 500 mcg (7 mL, 2%), salmeterol (15 mL, 2%), and placebo (-60 mL, -3%). Two (2) trials were primarily designed to evaluate the effect of ADVAIR DISKUS 250/50 on exacerbations. In these 2 trials, exacerbations were defined as worsening of 2 or more major symptoms (dyspnea, sputum volume, and sputum purulence) or worsening of any 1 major symptom together with any 1 of the following minor symptoms: sore throat, colds (nasal discharge and/or nasal congestion), fever without other cause, and increased cough or wheeze for at least 2 consecutive days. COPD exacerbations were considered of moderate severity if treatment with systemic corticosteroids and/or antibiotics was required and were considered severe if hospitalization was required. Exacerbations were also evaluated as a secondary outcome in the 1- and 3-year trials with ADVAIR DISKUS 500/50. There was not a symptomatic definition of exacerbation in these 2 trials. Exacerbations were defined in terms of severity requiring treatment with antibiotics and/or systemic corticosteroids (moderately severe) or requiring hospitalization (severe). The 2 exacerbation trials with ADVAIR DISKUS 250/50 were identical trials designed to evaluate the effect of ADVAIR DISKUS 250/50 and salmeterol 50 mcg, each given twice daily, on exacerbations of COPD over a 12-month period. A total of 1,579 subjects had an established history of COPD (but no other significant respiratory disorders). Subjects had a pre-bronchodilator FEV1 of 33% of predicted, a mean reversibility of 23% at baseline, and a history of ≥1 COPD exacerbation in the previous year that was moderate or severe. All subjects were treated with ADVAIR DISKUS 250/50 twice daily during a 4-week run-in period prior to being assigned trial treatment with twice-daily ADVAIR DISKUS 250/50 or salmeterol 50 mcg. In both trials, treatment with ADVAIR DISKUS 250/50 resulted in a significantly lower annual rate of moderate/severe COPD exacerbations compared with salmeterol (30.5% reduction [95% CI: 17.0, 41.8], P<0.001) in the first trial and (30.4% reduction [95% CI: 16.9, 41.7], P<0.001) in the second trial. Subjects treated with ADVAIR DISKUS 250/50 also had a significantly lower annual rate of exacerbations requiring treatment with oral corticosteroids compared with subjects treated with salmeterol (39.7% reduction [95% CI: 22.8, 52.9], P<0.001) in the first trial and (34.3% reduction [95% CI: 18.6, 47.0], P<0.001) in the second trial. Secondary endpoints including pulmonary function and symptom scores improved more in subjects treated with ADVAIR DISKUS 250/50 than with salmeterol 50 mcg in both trials. Exacerbations were evaluated in the 1- and the 3-year trials with ADVAIR DISKUS 500/50 as 1 of the secondary efficacy endpoints. In the 1-year trial, the group receiving ADVAIR DISKUS 500/50 had a significantly lower rate of moderate and severe exacerbations compared with placebo (25.4% reduction compared with placebo [95% CI: 13.5, 35.7]) but not when compared with its components (7.5% reduction compared with fluticasone propionate [95% CI: -7.3, 20.3] and 7% reduction compared with salmeterol [95% CI: -8.0, 19.9]). In the 3-year trial, the group receiving ADVAIR DISKUS 500/50 had a significantly lower rate of moderate and severe exacerbations compared with each of the other treatment groups (25.1% reduction compared with placebo [95% CI: 18.6, 31.1], 9.0% reduction compared with fluticasone propionate [95% CI: 1.2, 16.2], and 12.2% reduction compared with salmeterol [95% CI: 4.6, 19.2]). There were no trials conducted to directly compare the efficacy of ADVAIR DISKUS 250/50 with ADVAIR DISKUS 500/50 on exacerbations. Across trials, the reduction in exacerbations seen with ADVAIR DISKUS 500/50 was not greater than the reduction in exacerbations seen with ADVAIR DISKUS 250/50. A 3-year multicenter, international trial evaluated the efficacy of ADVAIR DISKUS 500/50 compared with fluticasone propionate 500 mcg, salmeterol 50 mcg, and placebo on survival in 6,112 subjects with COPD. During the trial subjects were permitted usual COPD therapy with the exception of other ICS and long-acting bronchodilators. The subjects were aged 40 to 80 years with an established history of COPD, a pre-bronchodilator FEV1 <60% of predicted at trial entry, and <10% of predicted reversibility. Each subject who withdrew from double-blind treatment for any reason was followed for the full 3-year trial period to determine survival status. The primary efficacy endpoint was all-cause mortality. Survival with ADVAIR DISKUS 500/50 was not significantly improved compared with placebo or the individual components (all-cause mortality rate 12.6% ADVAIR DISKUS versus 15.2% placebo). The rates for all-cause mortality were 13.5% and 16.0% in the groups treated with salmeterol 50 mcg and fluticasone propionate 500 mcg, respectively. Secondary outcomes, including pulmonary function (post-bronchodilator FEV1), improved with ADVAIR DISKUS 500/50, salmeterol 50 mcg, and fluticasone propionate 500 mcg compared with placebo. ADVAIR DISKUS 100/50 is supplied as a disposable purple plastic inhaler containing a foil blister strip with 60 blisters. The inhaler is packaged in a plastic-coated, moisture-protective foil pouch (NDC 0173-0695-00). ADVAIR DISKUS 100/50 is also supplied in an institutional pack containing 14 blisters (NDC 0173-0695-04). ADVAIR DISKUS 250/50 is supplied as a disposable purple plastic inhaler containing a foil blister strip with 60 blisters. The inhaler is packaged in a plastic-coated, moisture-protective foil pouch (NDC 0173-0696-00). ADVAIR DISKUS 250/50 is also supplied in an institutional pack containing 14 blisters (NDC 0173-0696-04). 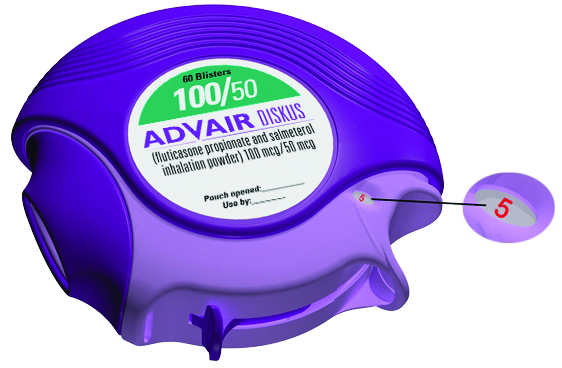 ADVAIR DISKUS 500/50 is supplied as a disposable purple plastic inhaler containing a foil blister strip with 60 blisters. The inhaler is packaged in a plastic-coated, moisture-protective foil pouch (NDC 0173-0697-00). ADVAIR DISKUS 500/50 is also supplied in an institutional pack containing 14 blisters (NDC 0173-0697-04). ADVAIR DISKUS should be stored inside the unopened moisture-protective foil pouch and only removed from the pouch immediately before initial use. Discard ADVAIR DISKUS 1 month after opening the foil pouch or when the counter reads “0” (after all blisters have been used), whichever comes first. The inhaler is not reusable. Do not attempt to take the inhaler apart. Inform patients with asthma that LABA when used alone increases the risk of asthma-related hospitalization or asthma-related death. Available data show that when ICS and LABA are used together, such as with ADVAIR DISKUS, there is not a significant increase in the risk of these events. Inform patients that ADVAIR DISKUS is not meant to relieve acute asthma symptoms or exacerbations of COPD and extra doses should not be used for that purpose. Advise patients to treat acute symptoms with an inhaled, short-acting beta2-agonist such as albuterol. Provide patients with such medication and instruct them in how it should be used. Tell patients they should not stop therapy with ADVAIR DISKUS without physician/provider guidance since symptoms may recur after discontinuation. Instruct patients not to use other LABA for asthma and COPD. Inform patients that localized infections with Candida albicans occurred in the mouth and pharynx in some patients. If oropharyngeal candidiasis develops, treat it with appropriate local or systemic (i.e., oral) antifungal therapy while still continuing therapy with ADVAIR DISKUS, but at times therapy with ADVAIR DISKUS may need to be temporarily interrupted under close medical supervision. Advise patients to rinse the mouth with water without swallowing after inhalation to help reduce the risk of thrush. Advise patients that ADVAIR DISKUS may cause systemic corticosteroid effects of hypercorticism and adrenal suppression. Additionally, inform patients that deaths due to adrenal insufficiency have occurred during and after transfer from systemic corticosteroids. Patients should taper slowly from systemic corticosteroids if transferring to ADVAIR DISKUS. Advise patients that immediate hypersensitivity reactions (e.g., urticaria, angioedema, rash, bronchospasm, hypotension), including anaphylaxis, may occur after administration of ADVAIR DISKUS. Patients should discontinue ADVAIR DISKUS if such reactions occur. There have been reports of anaphylactic reactions in patients with severe milk protein allergy after inhalation of powder products containing lactose; therefore, patients with severe milk protein allergy should not take ADVAIR DISKUS. Inform patients that orally inhaled corticosteroids, including fluticasone propionate, may cause a reduction in growth velocity when administered to pediatric patients. Physicians should closely follow the growth of children and adolescents taking corticosteroids by any route. ©2019 GSK group of companies or its licensor. ADVAIR DISKUS combines the inhaled corticosteroid (ICS) medicine fluticasone propionate and the long-acting beta 2-adrenergic agonist (LABA) medicine salmeterol. ICS medicines such as fluticasone propionate help to decrease inflammation in the lungs. Inflammation in the lungs can lead to breathing problems. LABA medicines such as salmeterol help the muscles around the airways in your lungs stay relaxed to prevent symptoms, such as wheezing, cough, chest tightness, and shortness of breath. These symptoms can happen when the muscles around the airways tighten. This makes it hard to breathe. 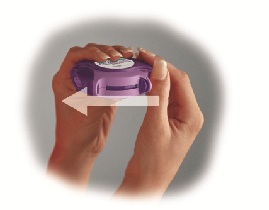 ADVAIR DISKUS is not used to relieve sudden breathing problems and will not replace a rescue inhaler. It is not known if ADVAIR DISKUS is safe and effective in children younger than 4 years. ADVAIR DISKUS is a prescription medicine used to control symptoms of asthma and to prevent symptoms such as wheezing in adults and children aged 4 years and older. ADVAIR DISKUS contains salmeterol, the same medicine found in SEREVENT DISKUS (salmeterol xinafoate inhalation powder). LABA medicines such as salmeterol when used alone increase the risk of hospitalizations and death from asthma problems. ADVAIR DISKUS contains an ICS and a LABA. When an ICS and LABA are used together, there is not a significant increased risk in hospitalizations and death from asthma problems. ADVAIR DISKUS is not for adults and children with asthma who are well controlled with an asthma control medicine, such as a low to medium dose of an ICS medicine. ADVAIR DISKUS is for adults and children with asthma who need both an ICS and LABA medicine. ADVAIR DISKUS 250/50 is a prescription medicine used to treat COPD. COPD is a chronic lung disease that includes chronic bronchitis, emphysema, or both. ADVAIR DISKUS 250/50 is used long term as 1 inhalation 2 times each day to improve symptoms of COPD for better breathing and to reduce the number of flare-ups (the worsening of your COPD symptoms for several days). to relieve sudden breathing problems. if you are allergic to fluticasone propionate, salmeterol, or any of the ingredients in ADVAIR DISKUS. See the end of this Patient Information for a complete list of ingredients in ADVAIR DISKUS. have or have had eye problems such as glaucoma, increased pressure in your eye, cataracts, or other changes in vision. are pregnant or plan to become pregnant. It is not known if ADVAIR DISKUS may harm your unborn baby. are breastfeeding. It is not known if the medicines in ADVAIR DISKUS pass into your milk and if they can harm your baby. Tell your healthcare provider about all the medicines you take, including prescription and over-the-counter medicines, vitamins, and herbal supplements. ADVAIR DISKUS and certain other medicines may interact with each other. This may cause serious side effects. Especially tell your healthcare provider if you take antifungal or anti-HIV medicines. How should I use ADVAIR DISKUS? Read the step-by-step instructions for using ADVAIR DISKUS at the end of this Patient Information. Do not use ADVAIR DISKUS unless your healthcare provider has taught you how to use the inhaler and you understand how to use it correctly. Children should use ADVAIR DISKUS with an adult’s help, as instructed by the child’s healthcare provider. ADVAIR DISKUS comes in 3 different strengths. Your healthcare provider prescribed the strength that is best for you. Use ADVAIR DISKUS exactly as your healthcare provider tells you to use it. Do not use ADVAIR DISKUS more often than prescribed. Use 1 inhalation of ADVAIR DISKUS 2 times each day. Use ADVAIR DISKUS at the same time each day, about 12 hours apart. If you miss a dose of ADVAIR DISKUS, just skip that dose. Take your next dose at your usual time. Do not take 2 doses at 1 time. If you take too much ADVAIR DISKUS, call your healthcare provider or go to the nearest hospital emergency room right away if you have any unusual symptoms, such as worsening shortness of breath, chest pain, increased heart rate, or shakiness. Do not stop using ADVAIR DISKUS, even if you are feeling better, unless your healthcare provider tells you to. ADVAIR DISKUS does not relieve sudden breathing problems. Always have a rescue inhaler with you to treat sudden symptoms. If you do not have a rescue inhaler, call your healthcare provider to have one prescribed for you. Rinse your mouth with water without swallowing after each dose of ADVAIR DISKUS. This will help lessen the chance of getting a yeast infection (thrush) in your mouth and throat. you have asthma and your symptoms do not improve after using ADVAIR DISKUS regularly for 1 week. What are the possible side effects of ADVAIR DISKUS? fungal infection in your mouth or throat (thrush). Rinse your mouth with water without swallowing after using ADVAIR DISKUS to help reduce your chance of getting thrush. reduced adrenal function (adrenal insufficiency). Adrenal insufficiency is a condition where the adrenal glands do not make enough steroid hormones. This can happen when you stop taking oral corticosteroid medicines (such as prednisone) and start taking a medicine containing an inhaled steroid (such as ADVAIR DISKUS). During this transition period, when your body is under stress such as from fever, trauma (such as a car accident), infection, surgery, or worse COPD symptoms, adrenal insufficiency can get worse and may cause death. sudden breathing problems immediately after inhaling your medicine. If you have sudden breathing problems immediately after inhaling your medicine, stop using ADVAIR DISKUS and call your healthcare provider right away. slowed growth in children. Your child’s growth should be checked regularly by the healthcare provider while using ADVAIR DISKUS. eye problems including glaucoma, increased pressure in your eye, cataracts, or other changes in vision. You should have regular eye exams while using ADVAIR DISKUS. changes in laboratory blood levels (sugar, potassium, certain types of white blood cells). In children with asthma, infections in the ear, nose, and throat are common. These are not all the possible side effects of ADVAIR DISKUS. How should I store ADVAIR DISKUS? Store ADVAIR DISKUS at room temperature between 68°F and 77°F (20°C and 25°C). Keep in a dry place away from heat and sunlight. Store ADVAIR DISKUS in the unopened foil pouch and only open when ready for use. Safely throw away ADVAIR DISKUS in the trash 1 month after you open the foil pouch or when the counter reads 0, whichever comes first. Keep ADVAIR DISKUS and all medicines out of the reach of children. General information about the safe and effective use of ADVAIR DISKUS. Medicines are sometimes prescribed for purposes other than those listed in a Patient Information leaflet. Do not use ADVAIR DISKUS for a condition for which it was not prescribed. Do not give ADVAIR DISKUS to other people, even if they have the same symptoms that you have. It may harm them. You can ask your healthcare provider or pharmacist for information about ADVAIR DISKUS that was written for health professionals. What are the ingredients in ADVAIR DISKUS? For more information about ADVAIR DISKUS, call 1-888-825-5249 or visit our website at www.advair.com. Read this Instructions for Use before you start using ADVAIR DISKUS and each time you get a refill. There may be new information. This information does not take the place of talking to your healthcare provider about your medical condition or treatment. ADVAIR DISKUS is for oral inhalation use only. Take ADVAIR DISKUS out of the foil pouch just before you use it for the first time. Safely throw away the pouch. The DISKUS will be in the closed position. Write the date you opened the foil pouch in the first blank line on the label. See Figure A. Write the “use by” date in the second blank line on the label. See Figure A. That date is 1 month after the date you wrote in the first line. The counter should read 60. If you have a sample (with “Sample” on the back label) or institutional (with “INSTITUTIONAL PACK” on the back label) pack, the counter should read 14. Follow these steps every time you use ADVAIR DISKUS. Step 1. Open your ADVAIR DISKUS. 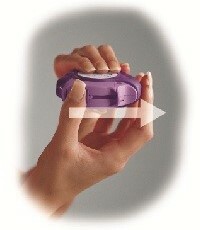 Hold the DISKUS in your left hand and place the thumb of your right hand in the thumb grip. Push the thumb grip away from you as far as it will go until the mouthpiece shows and snaps into place. See Figure B. Step 2. Slide the lever until you hear it click. Hold the DISKUS in a level, flat position with the mouthpiece towards you. Slide the lever away from the mouthpiece as far as it will go until it clicks. See Figure C.
The number on the counter will count down by 1. The DISKUS is now ready to use. Do not close the DISKUS. Do not tilt the DISKUS. Do not move the lever on the DISKUS. Step 3. Inhale your medicine. Before you breathe in your dose from the DISKUS, breathe out (exhale) as long as you can while you hold the DISKUS level and away from your mouth. See Figure D. Do not breathe into the mouthpiece. Put the mouthpiece to your lips. See Figure E. Breathe in quickly and deeply through the DISKUS. Do not breathe in through your nose. Remove the DISKUS from your mouth and hold your breath for about 10 seconds, or for as long as is comfortable for you. Breathe out slowly as long as you can. See Figure D.
The DISKUS delivers your dose of medicine as a very fine powder that you may or may not taste or feel. Do not take an extra dose from the DISKUS even if you do not taste or feel the medicine. Step 4. Close the DISKUS. Place your thumb in the thumb grip and slide it back towards you as far as it will go. See Figure F. Make sure the DISKUS clicks shut and you cannot see the mouthpiece. The DISKUS is now ready for you to take your next scheduled dose in about 12 hours. When you are ready to take your next dose, repeat Steps 1 through 4. Step 5. Rinse your mouth. Rinse your mouth with water after breathing in the medicine. Spit out the water. Do not swallow it. See Figure G.
When should you get a refill? The counter on top of the DISKUS shows you how many doses are left. After you have taken 55 doses (9 doses from the sample or institutional pack), the numbers 5 to 0 will show in red. See Figure H. These numbers warn you there are only a few doses left and are a reminder to get a refill. Always use the DISKUS in a level, flat position. Make sure the lever firmly clicks into place. Hold your breath for about 10 seconds after inhaling. Then breathe out fully. After each dose, rinse your mouth with water and spit it out. Do not swallow the water. Do not take an extra dose, even if you did not taste or feel the powder. Do not take the DISKUS apart. Do not wash the DISKUS. Always keep the DISKUS in a dry place. Do not use the DISKUS with a spacer device. For more information about ADVAIR DISKUS or how to use your inhaler, call 1-888-825-5249 or visit our website at www.advair.com. * Each blister contains 100 mcg of fluticasone propionate and 72.5 mcg of salmeterol xinafoate, equivalent to 50 mcg of salmeterol base, with lactose. Federal Law requires the dispensing of ADVAIR DISKUS with the Medication Guide inside the carton. * Each blister contains 250 mcg of fluticasone propionate and 72.5 mcg of salmeterol xinafoate, equivalent to 50 mcg of salmeterol base, with lactose. * Each blister contains 500 mcg of fluticasone propionate and 72.5 mcg of salmeterol xinafoate, equivalent to 50 mcg of salmeterol base, with lactose.